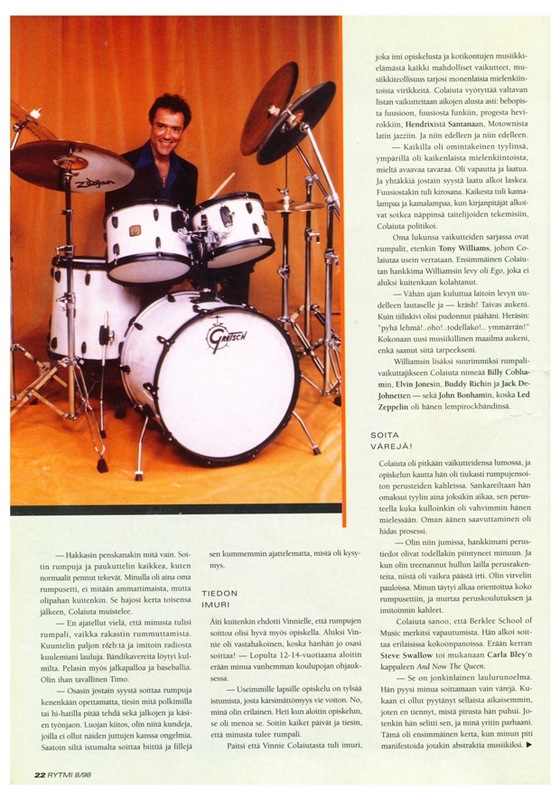 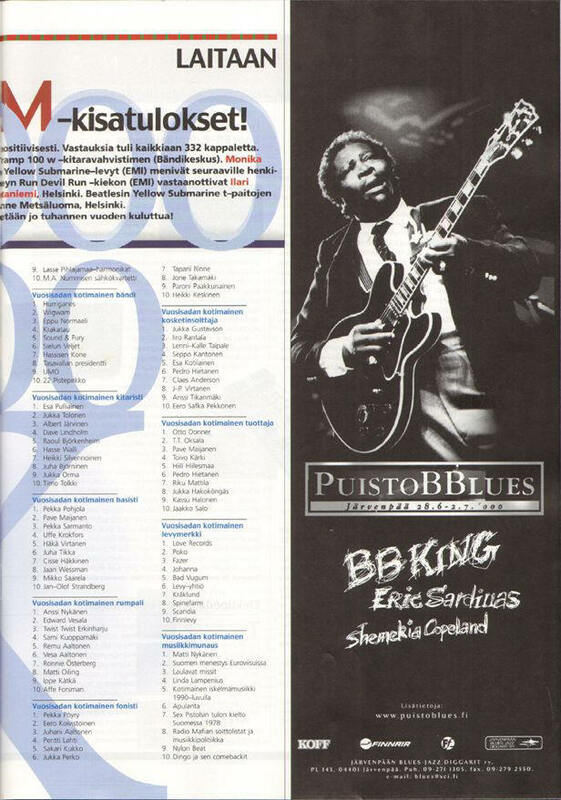 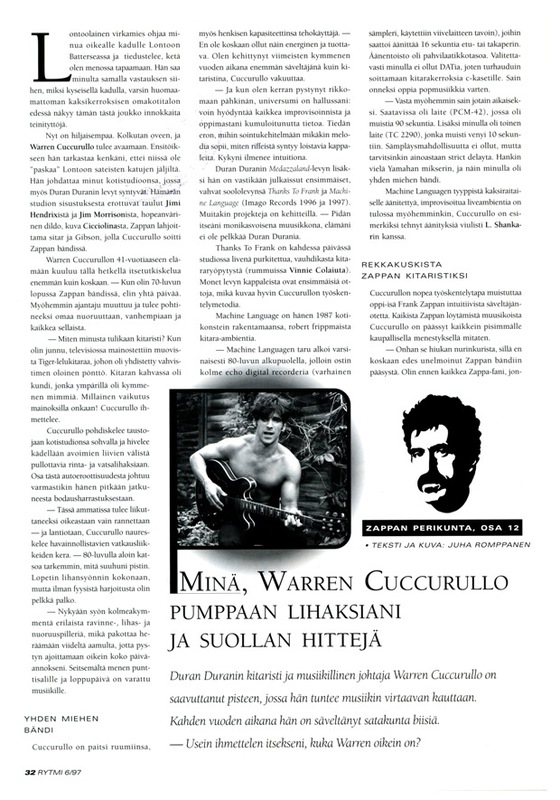 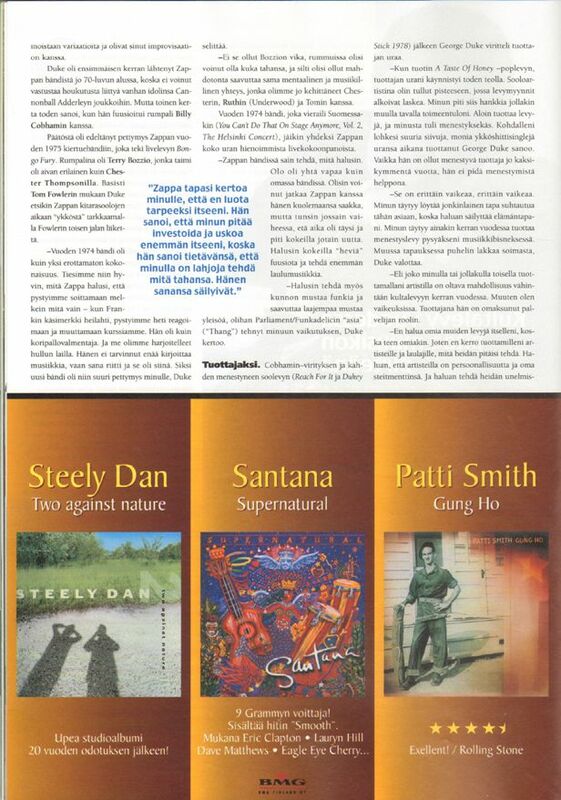 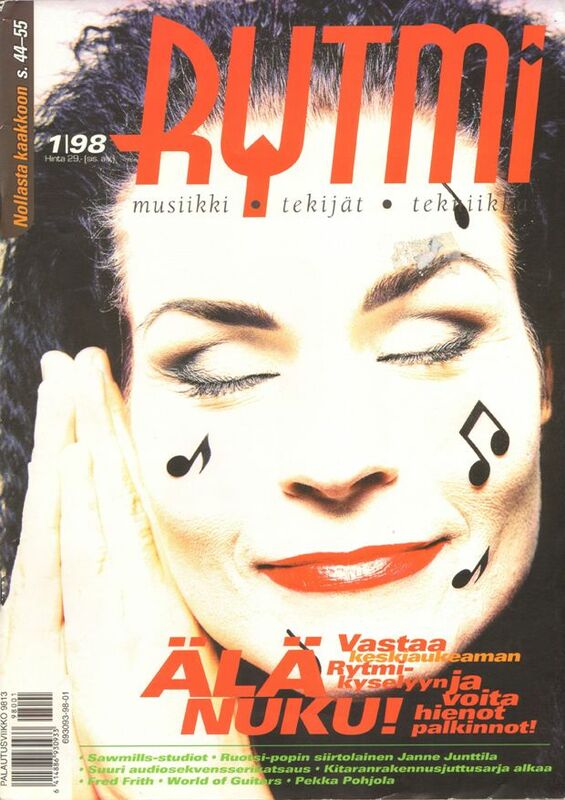 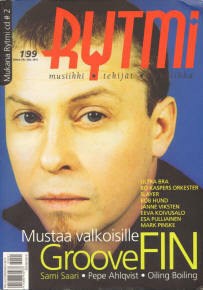 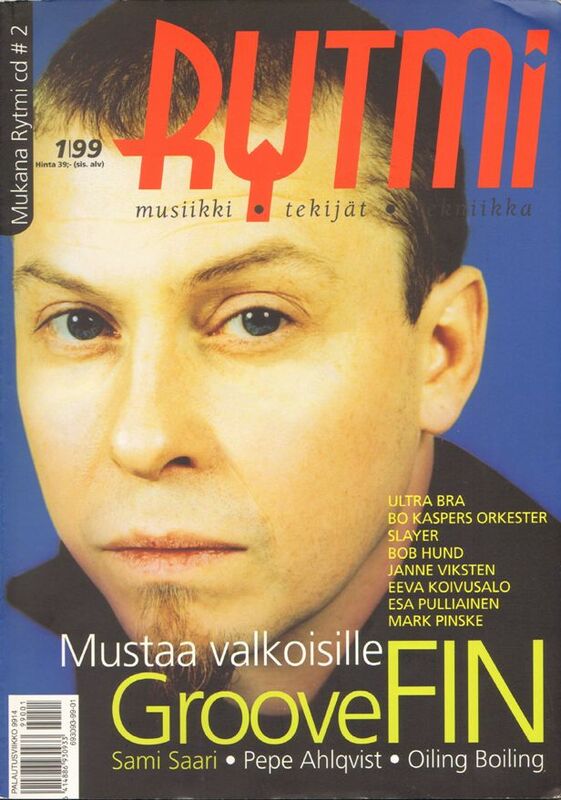 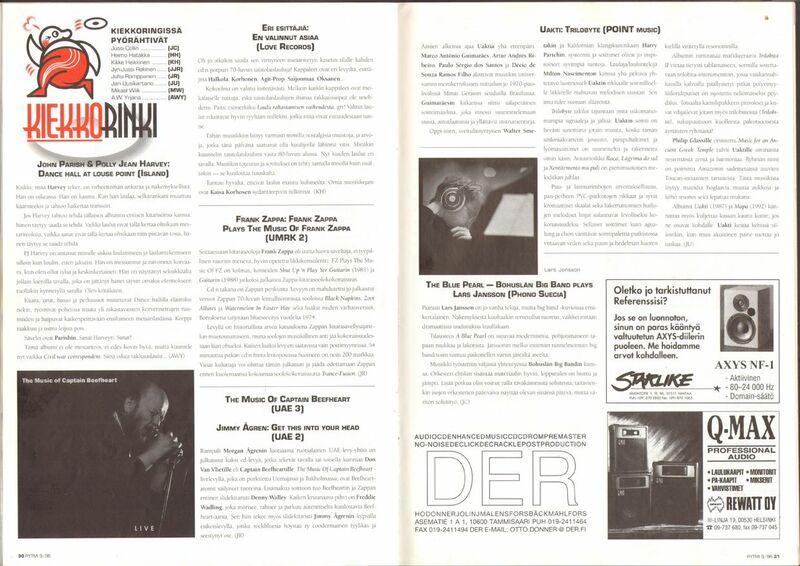 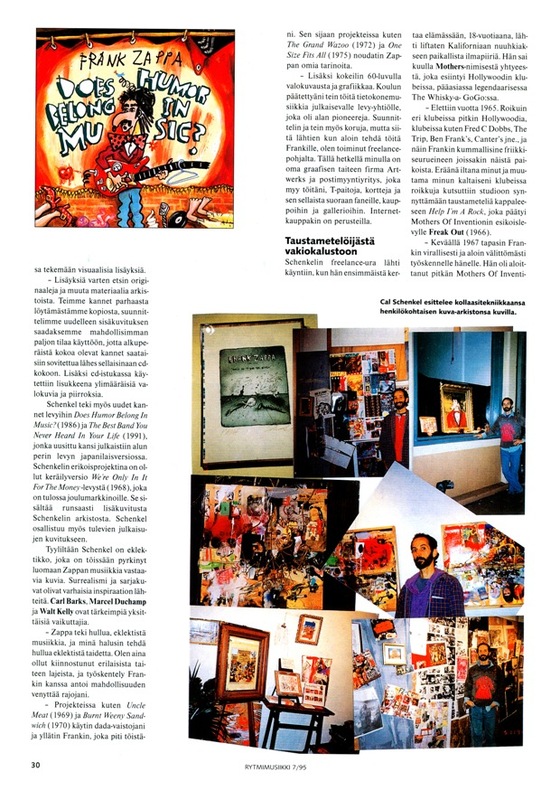 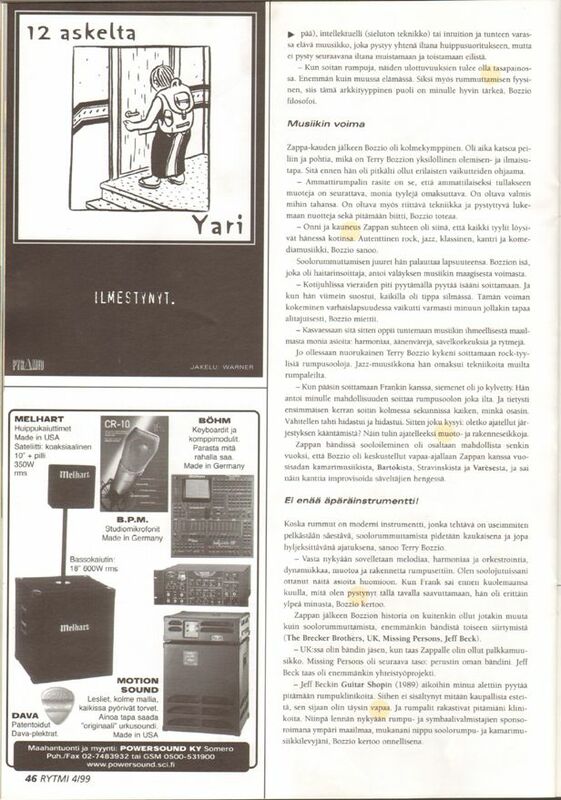 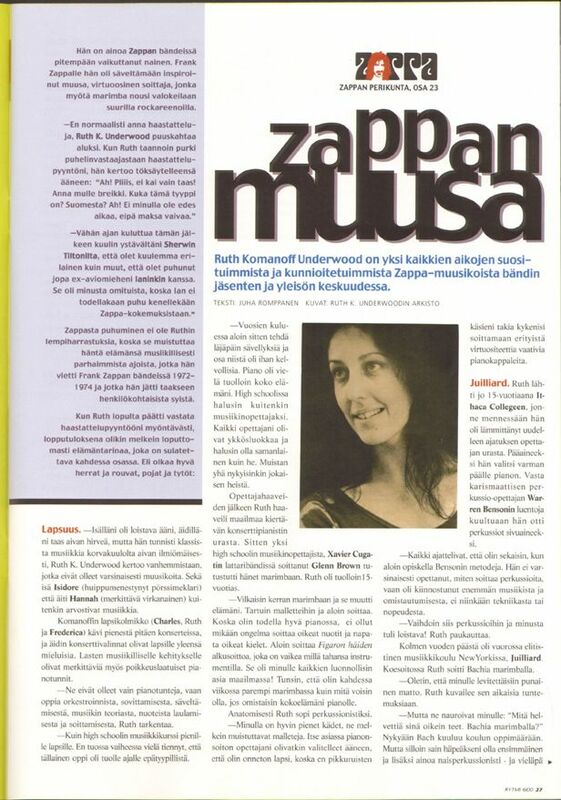 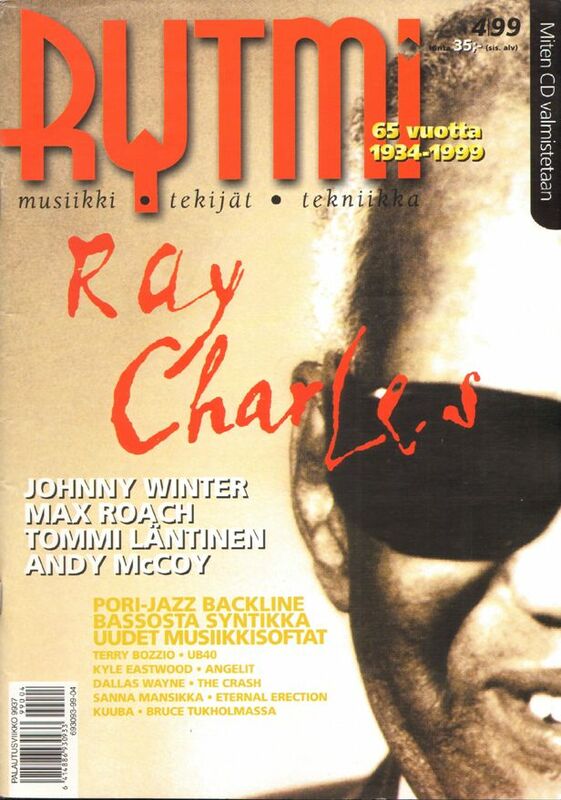 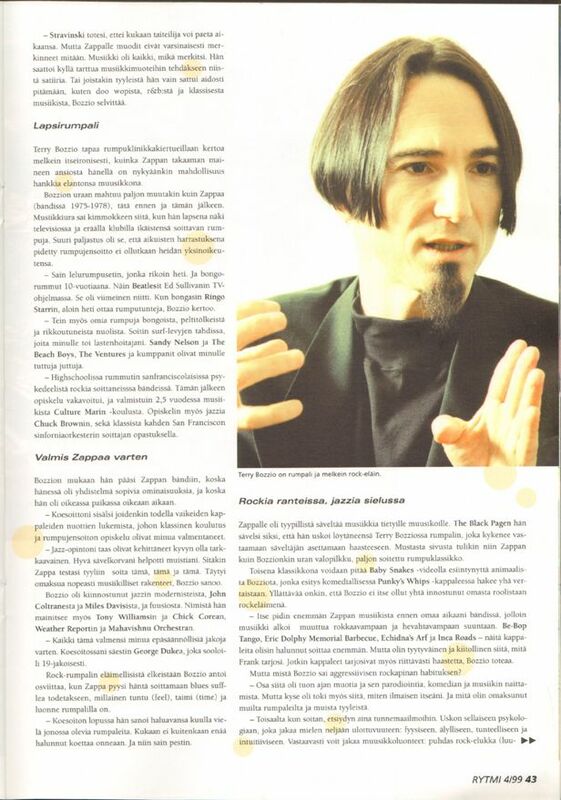 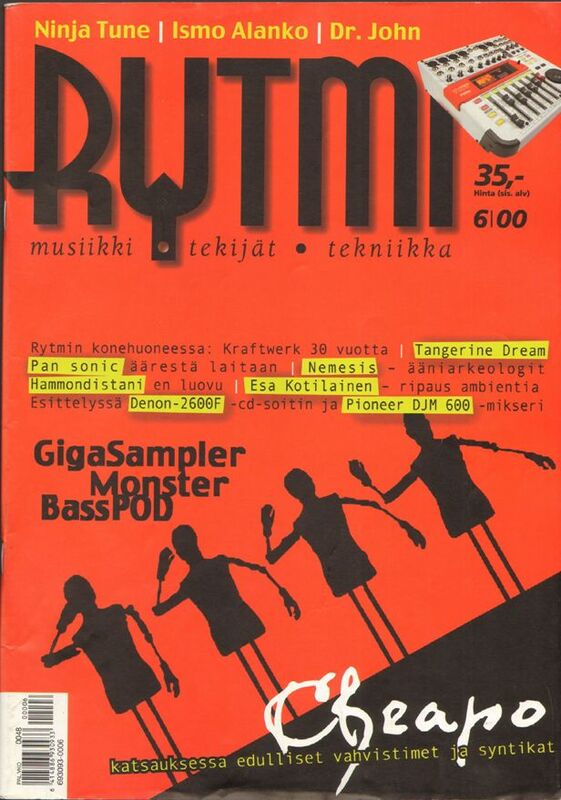 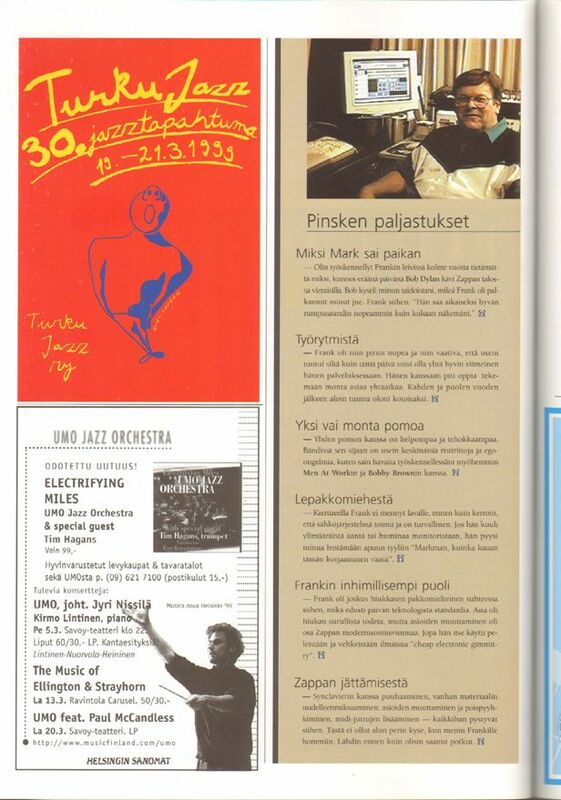 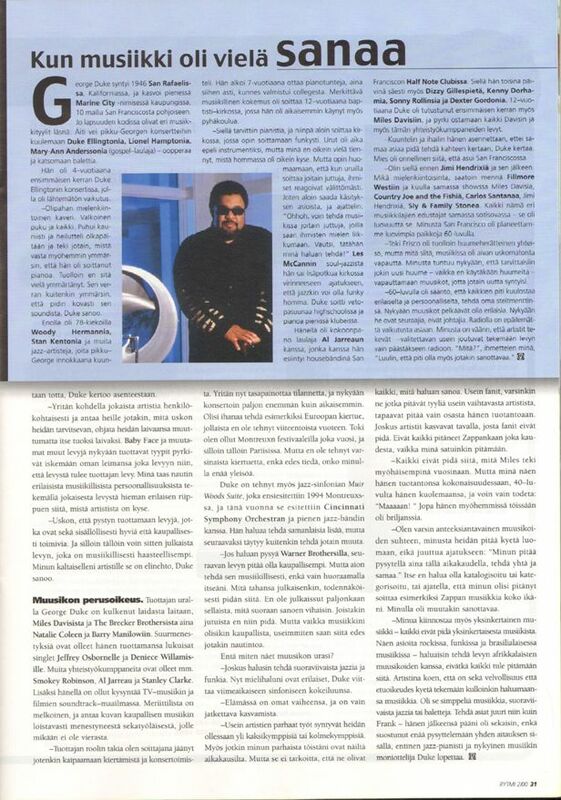 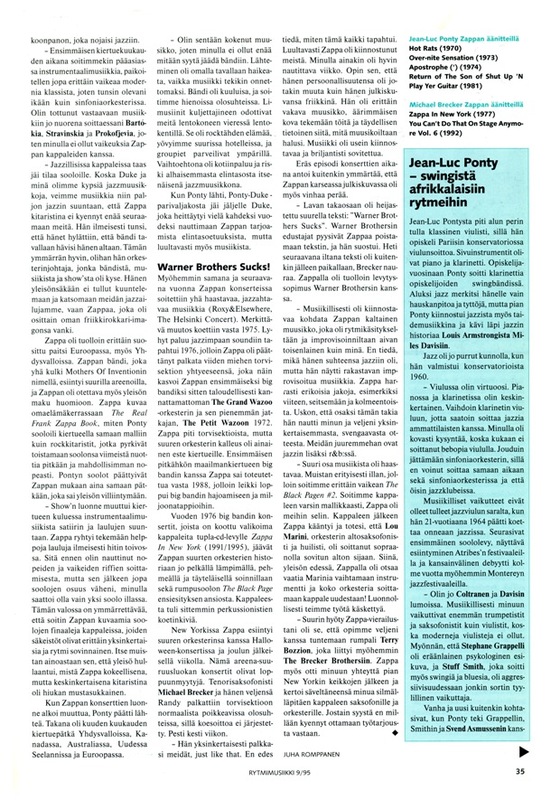 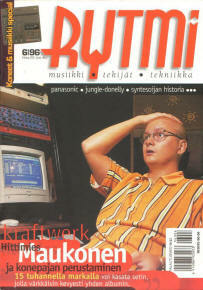 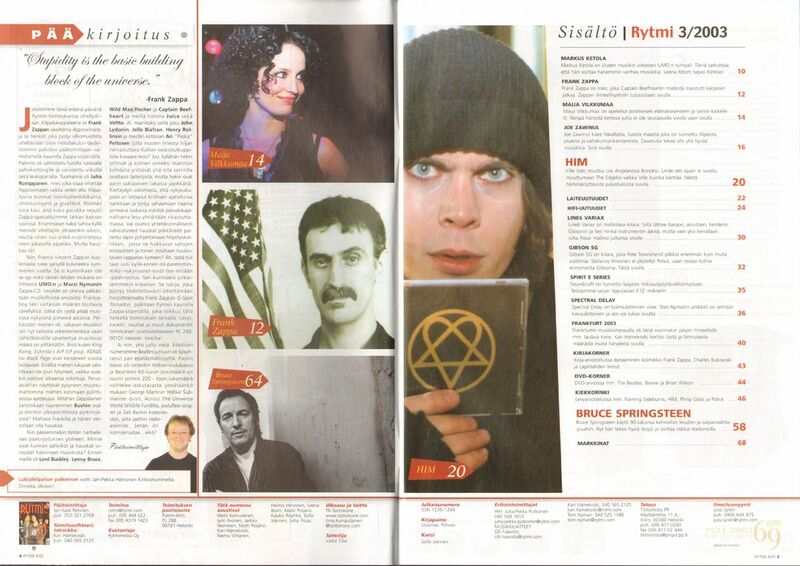 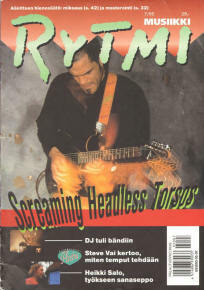 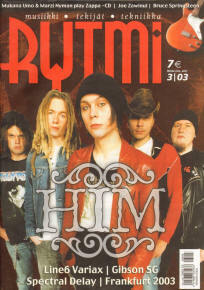 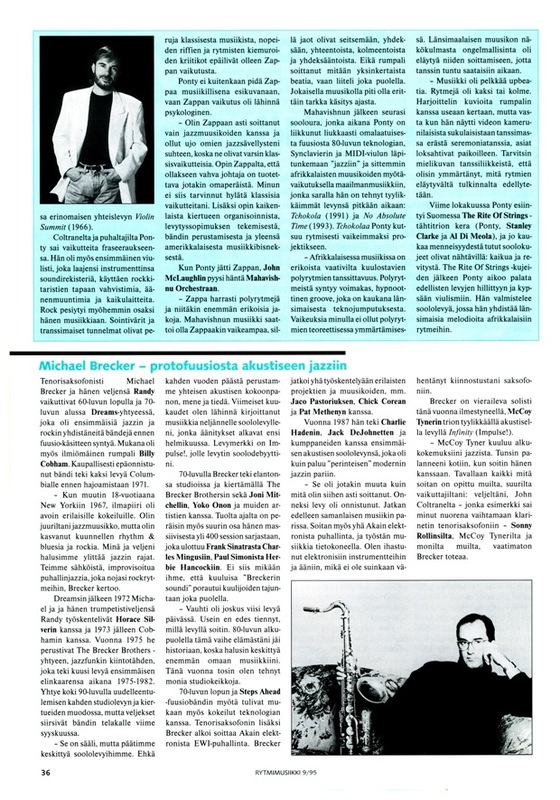 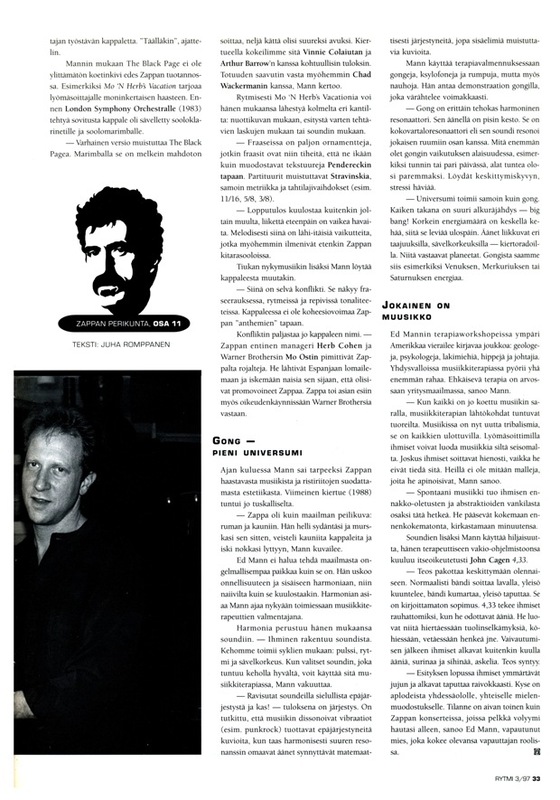 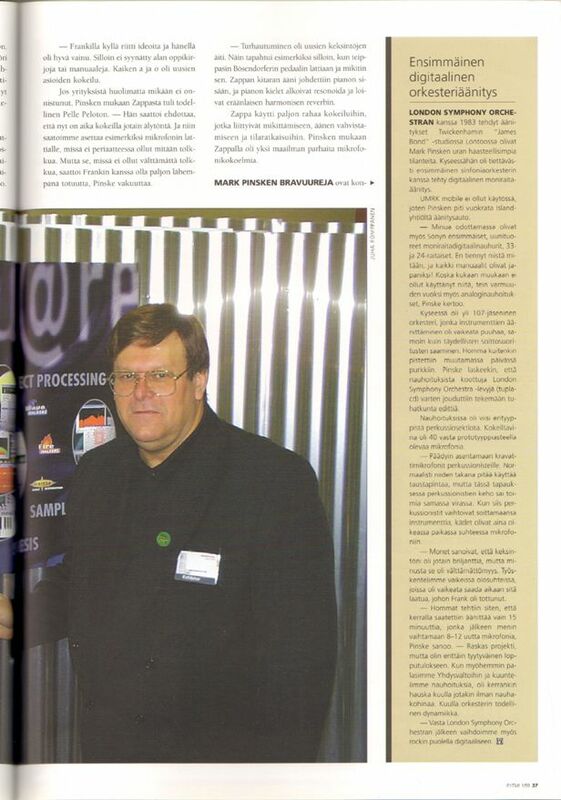 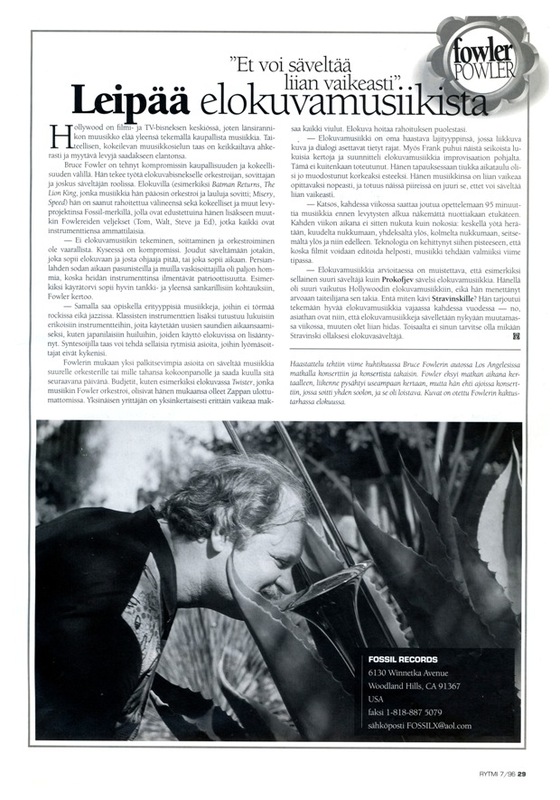 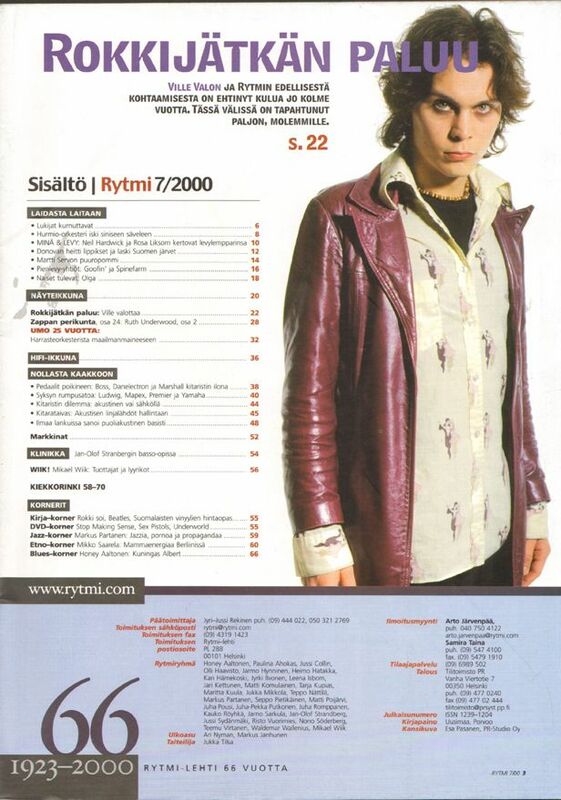 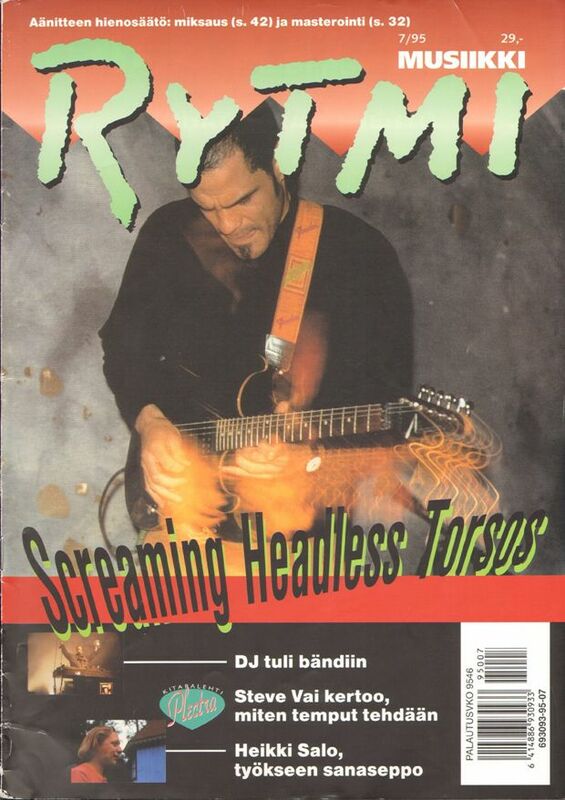 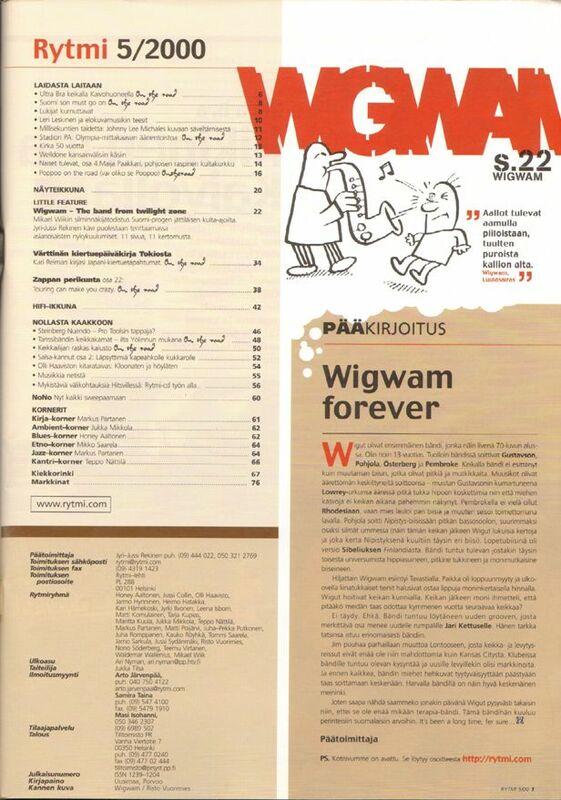 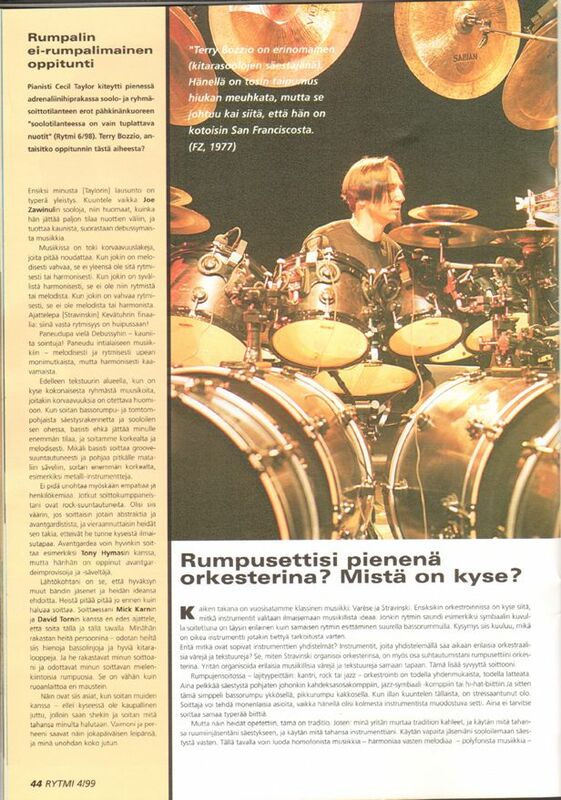 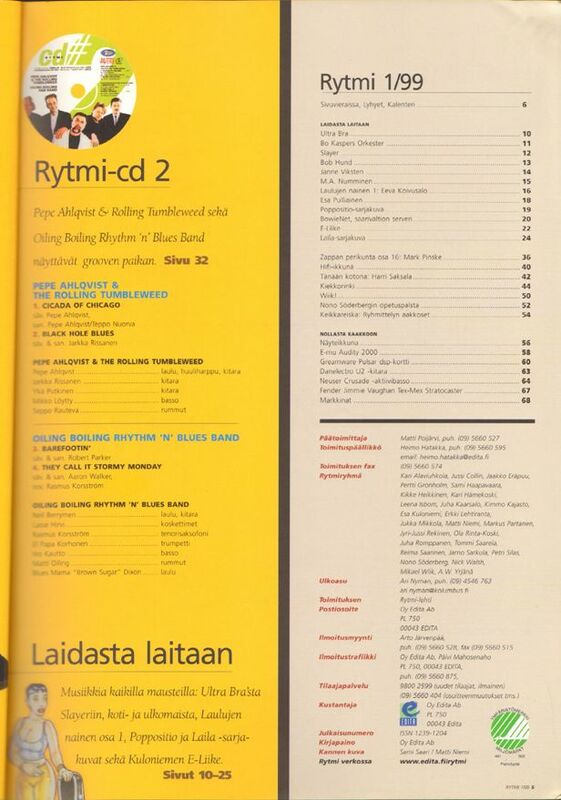 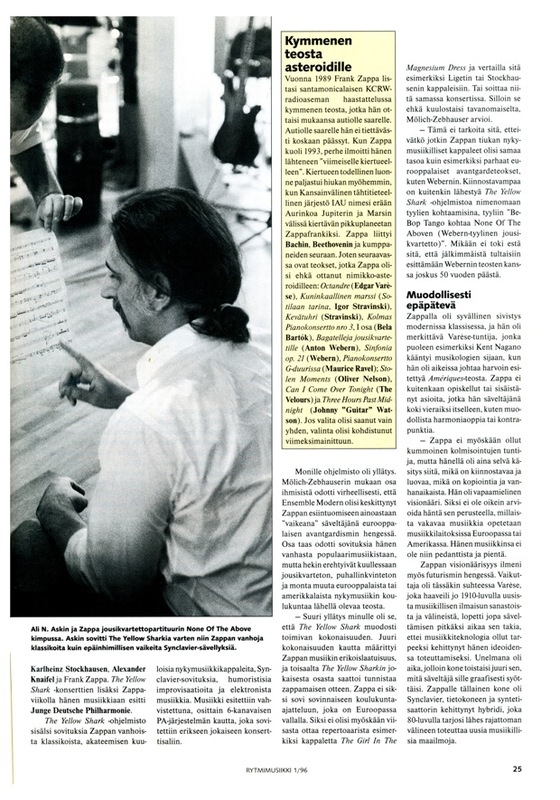 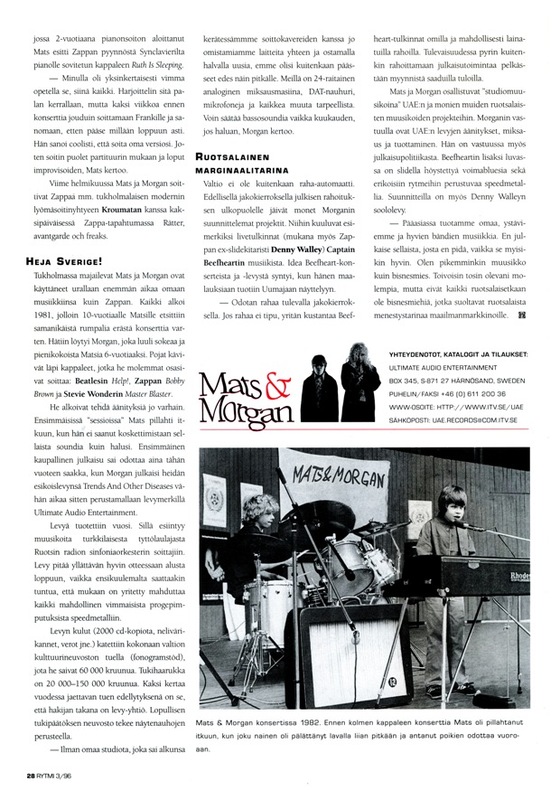 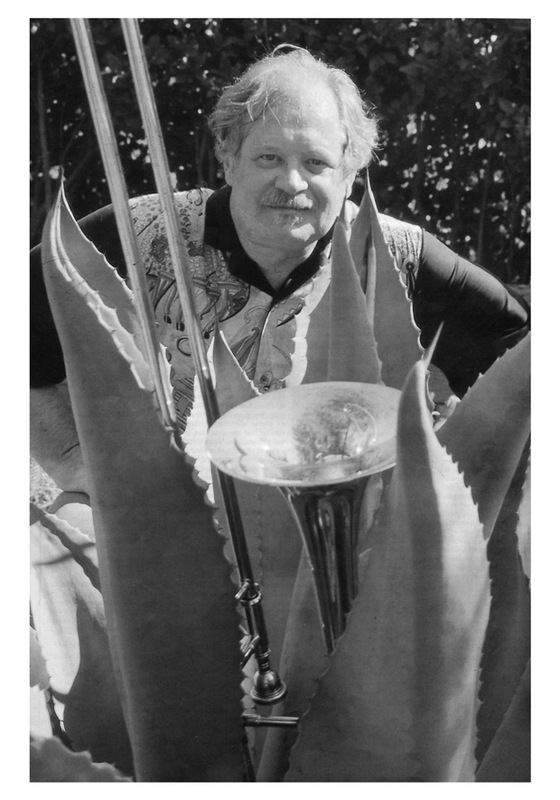 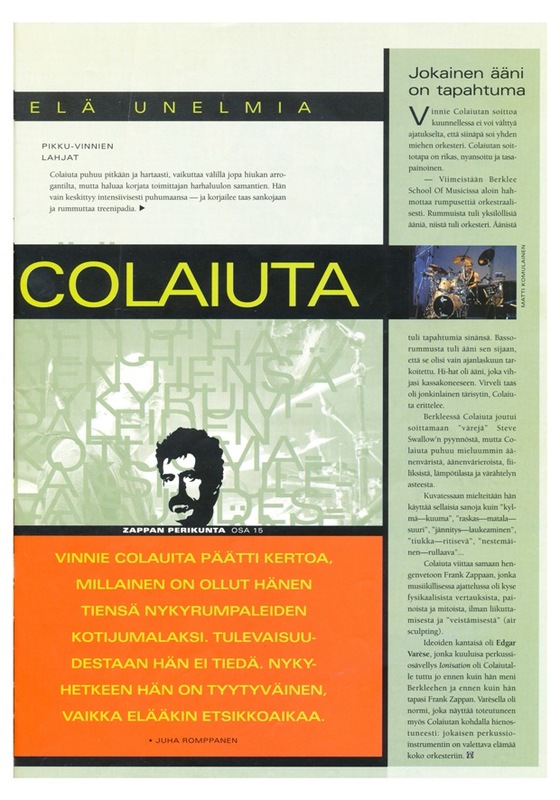 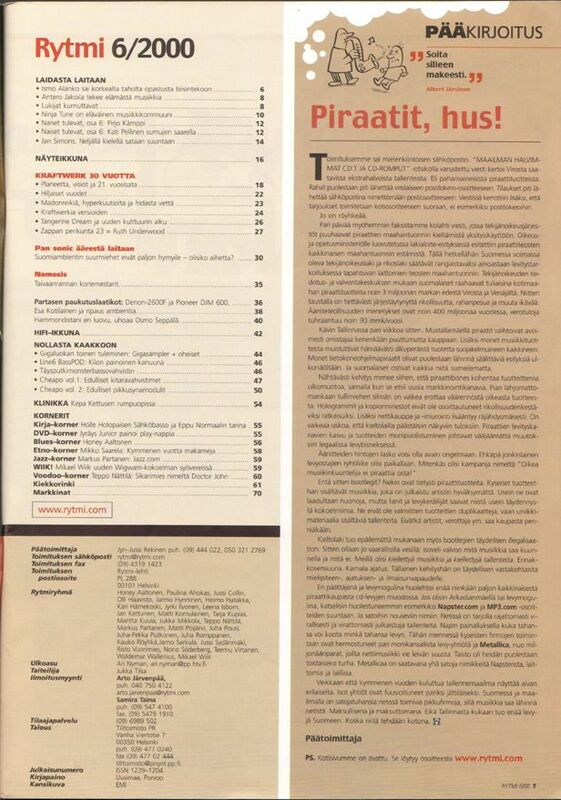 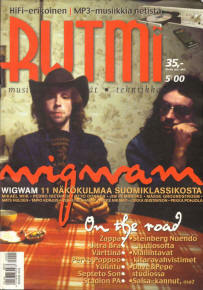 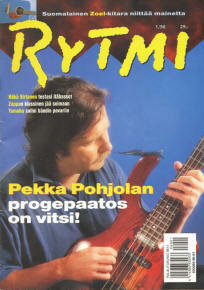 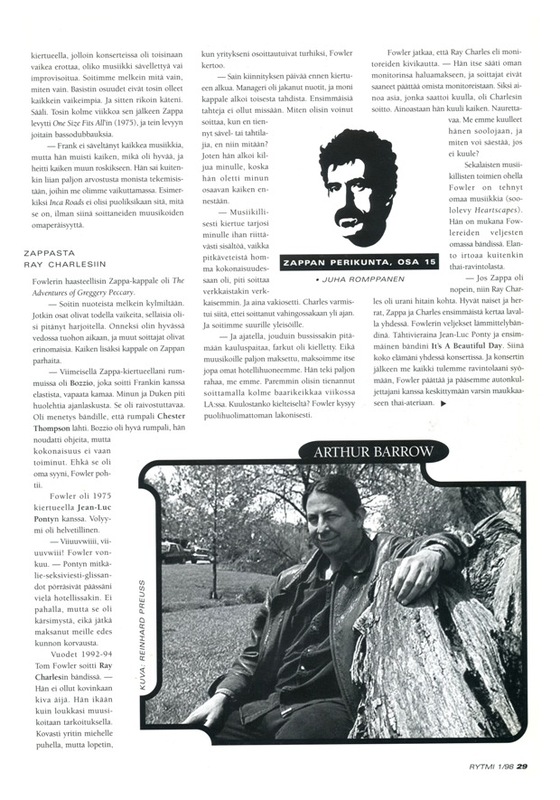 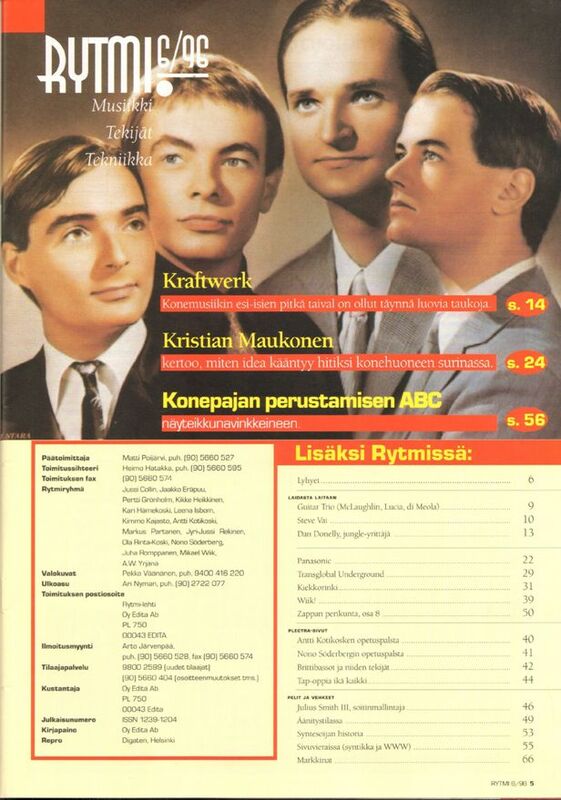 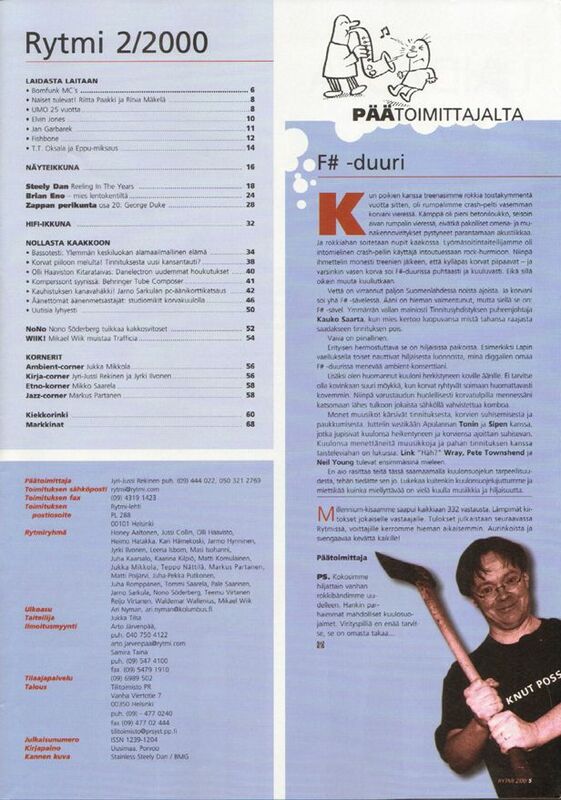 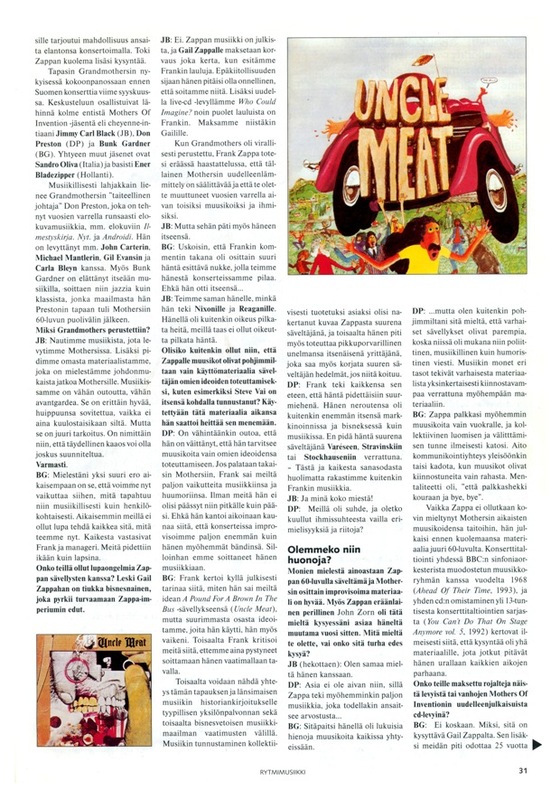 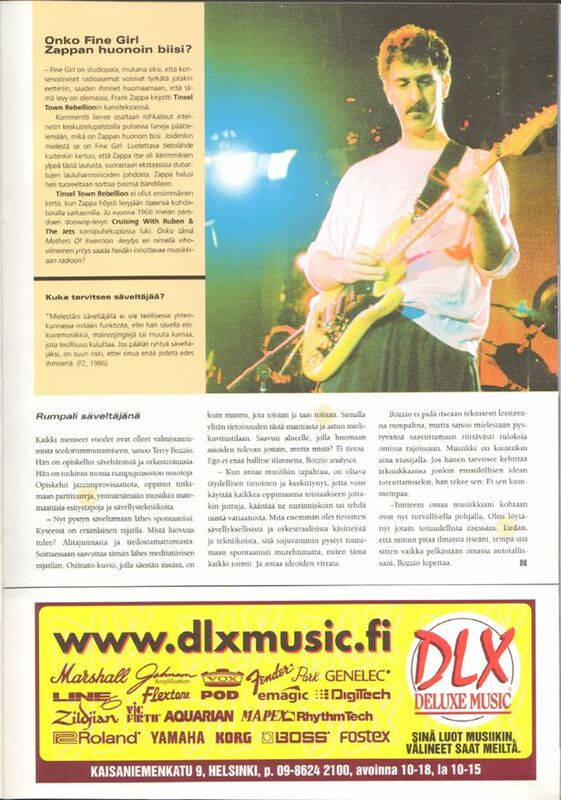 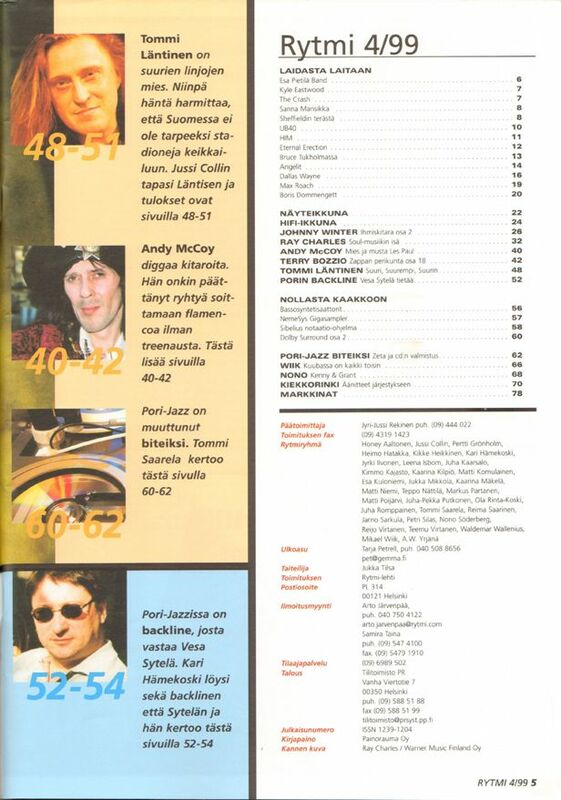 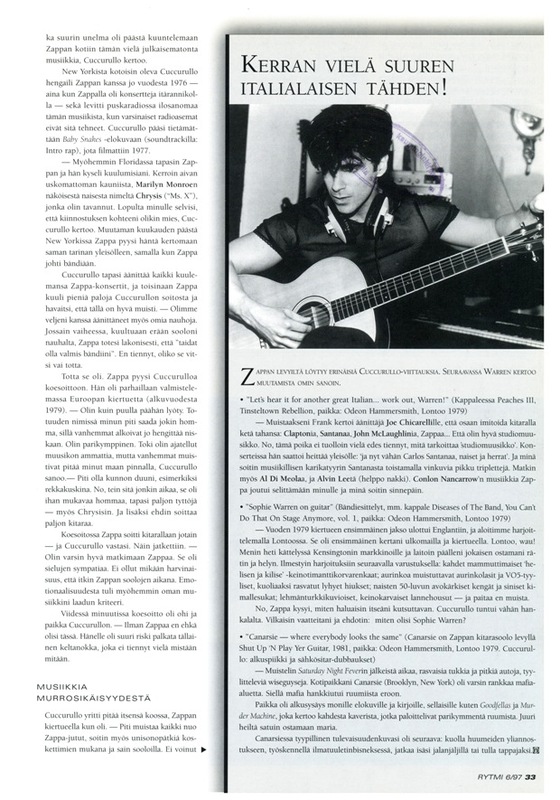 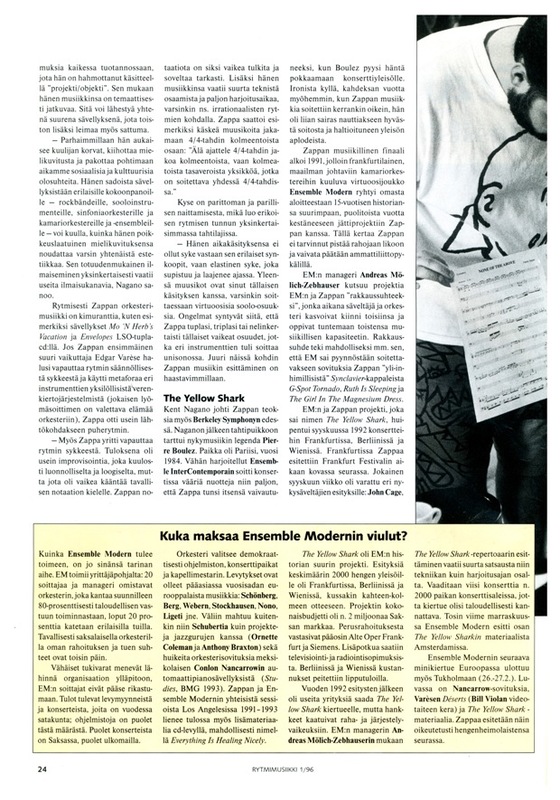 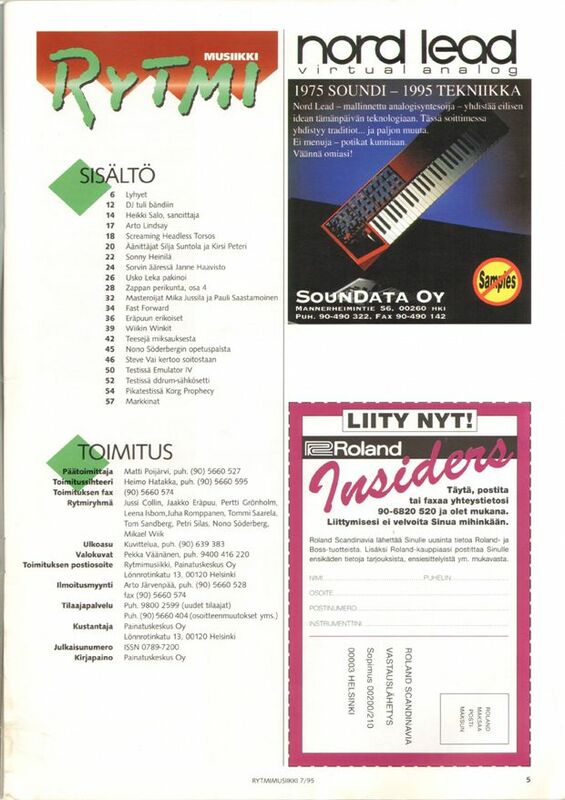 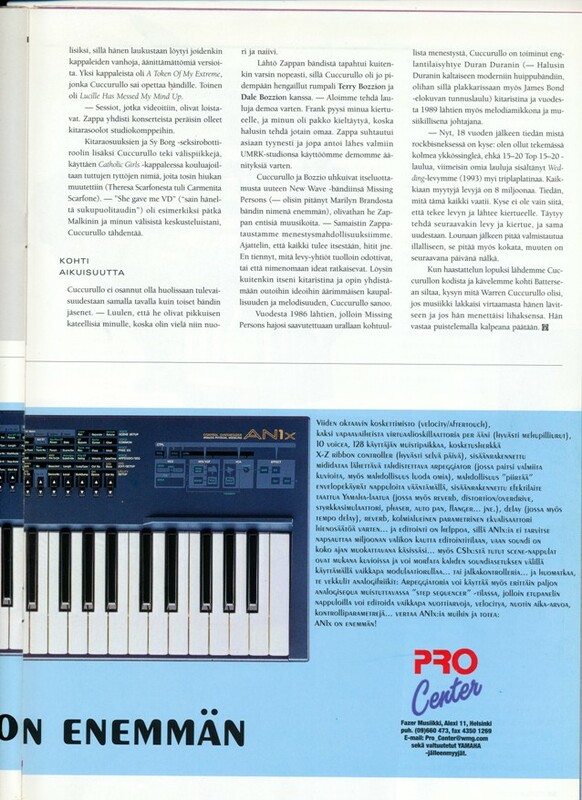 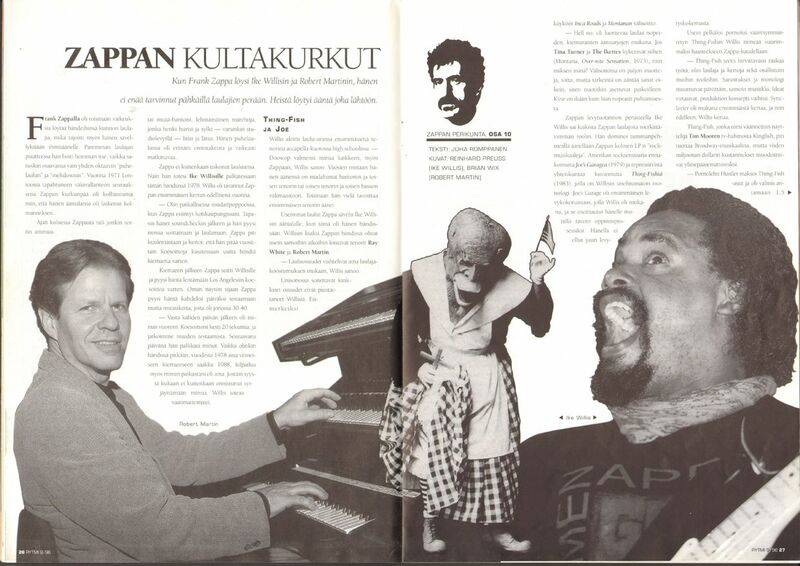 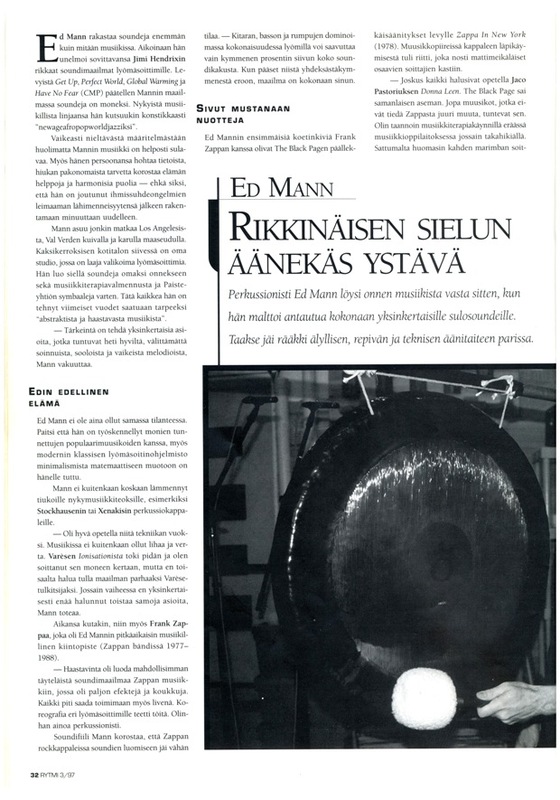 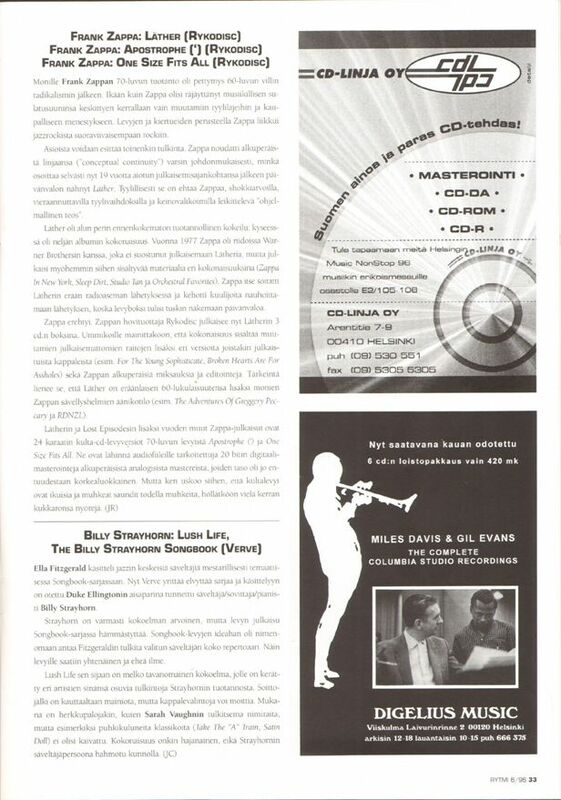 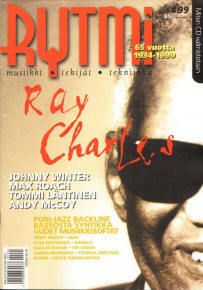 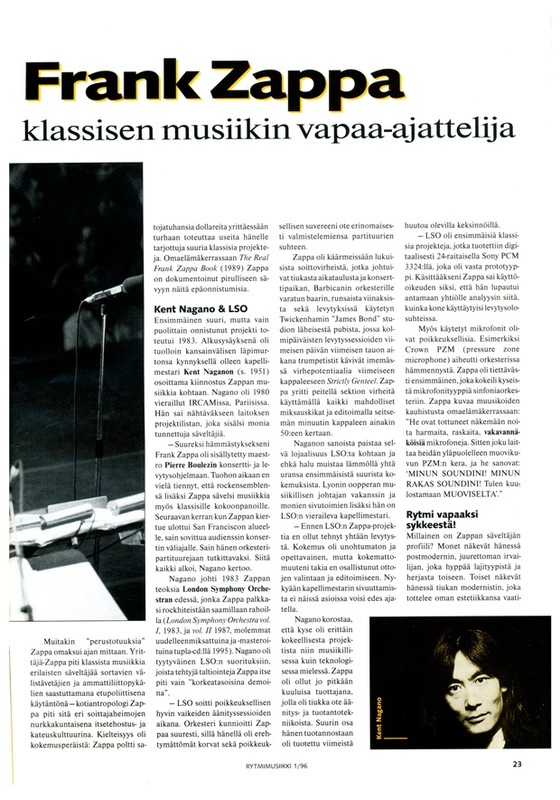 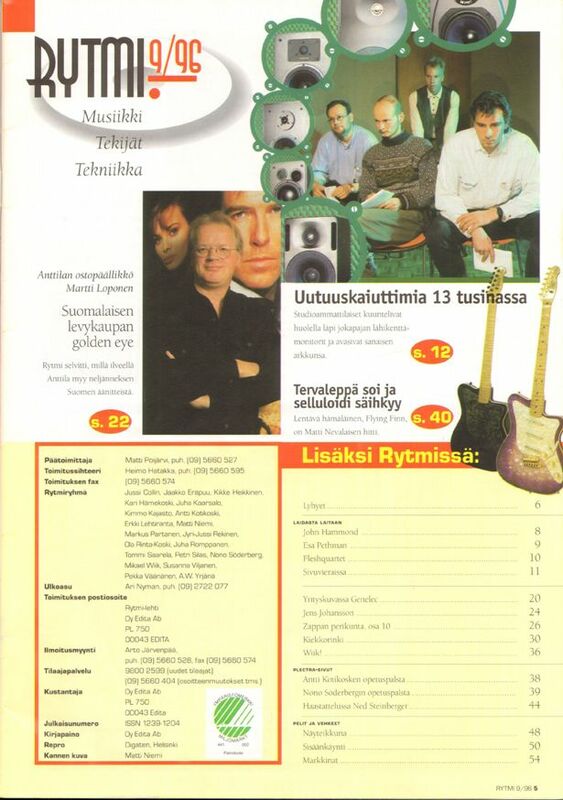 Some years, 1992-1995, the magazine was titled Rytmimusiikki. 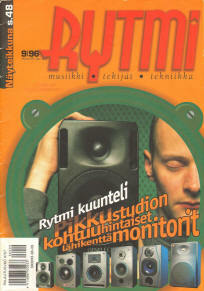 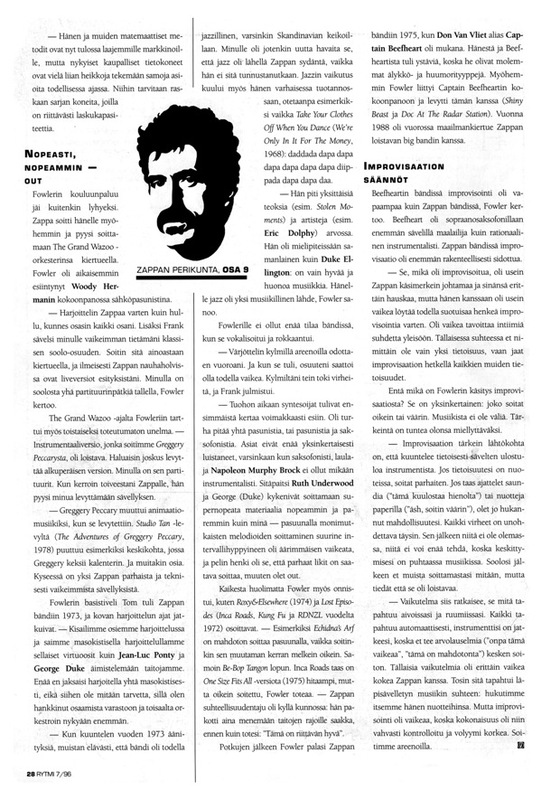 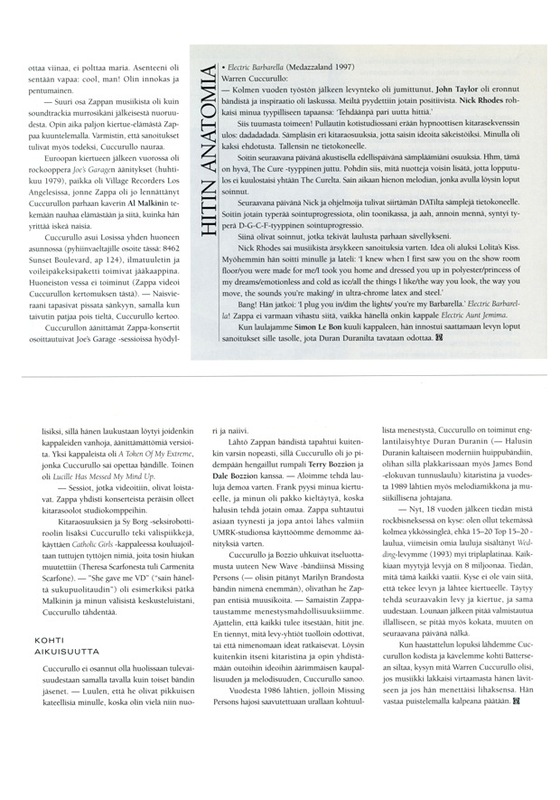 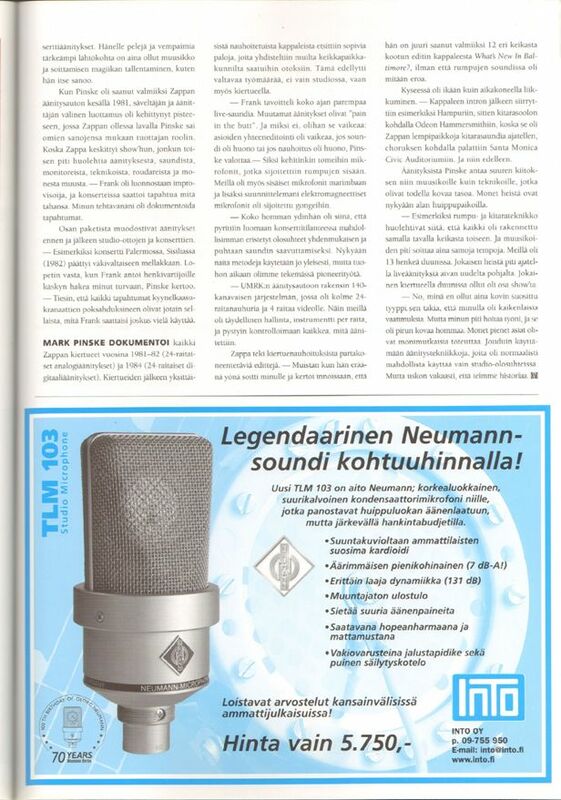 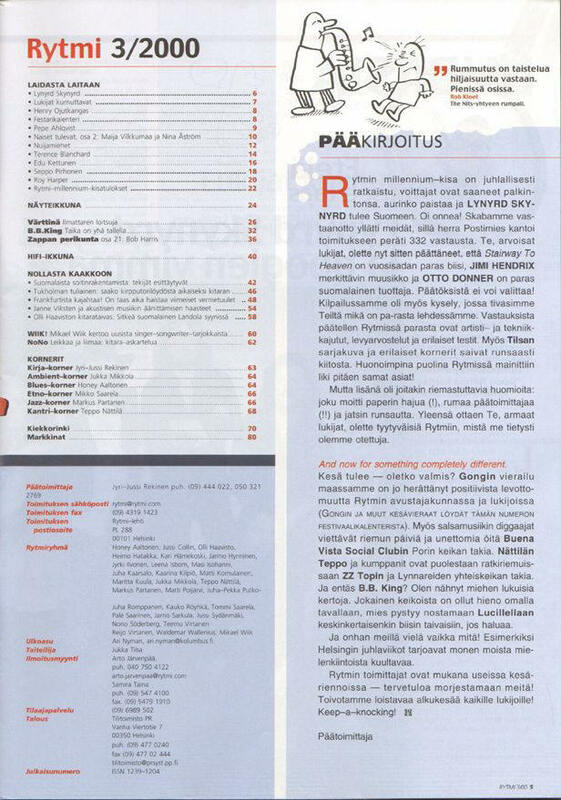 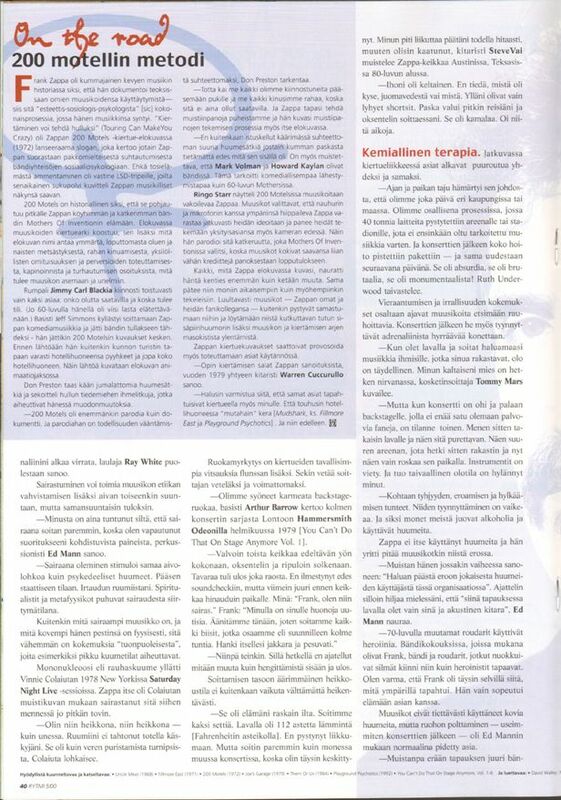 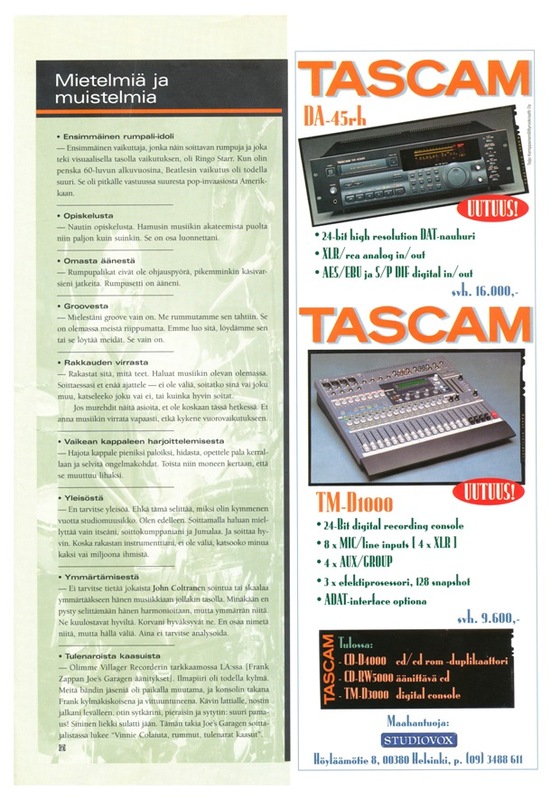 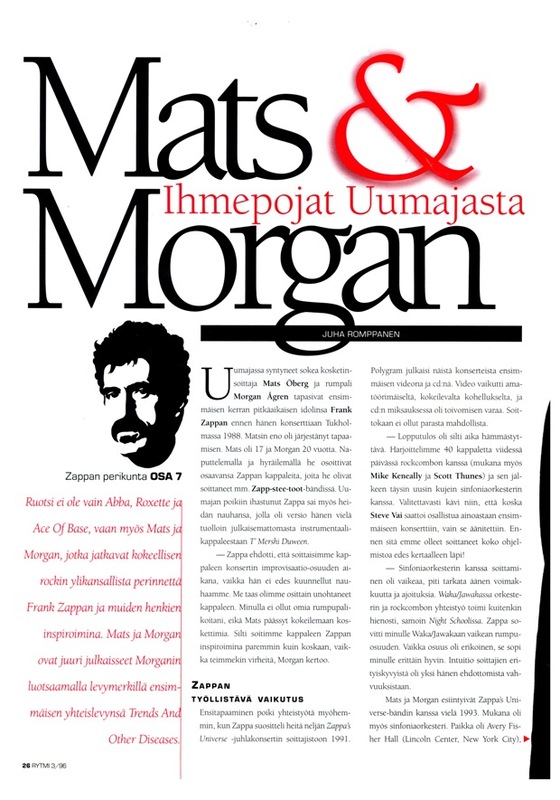 In the beginning of 2014 Rytmi ceased as a separate printed publication and merged with Soundi. Zappan perikunta (Zappa's heirs) series by Juha Romppanen was published from 1995/1 to 2000/7. 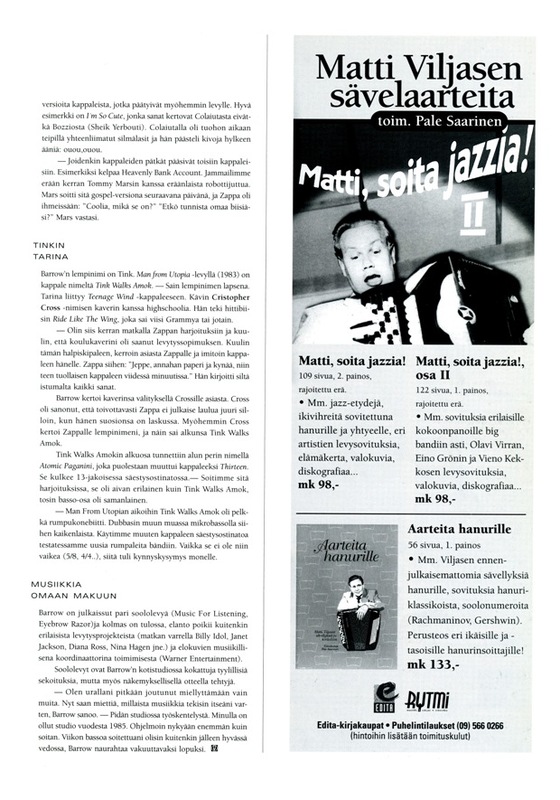 Due to longer breaks in publishing the series numbering is not correct. 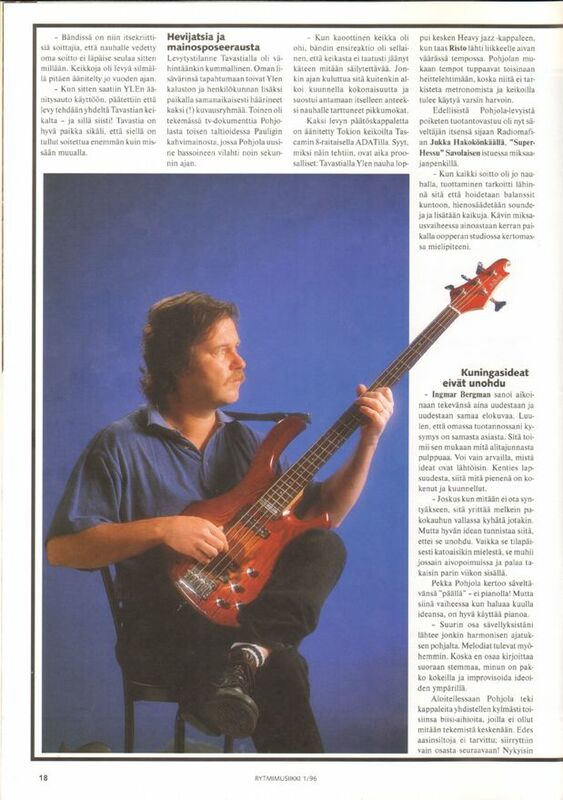 The bass players part from 1999/1 should be 14, not 15 as is printed on it. 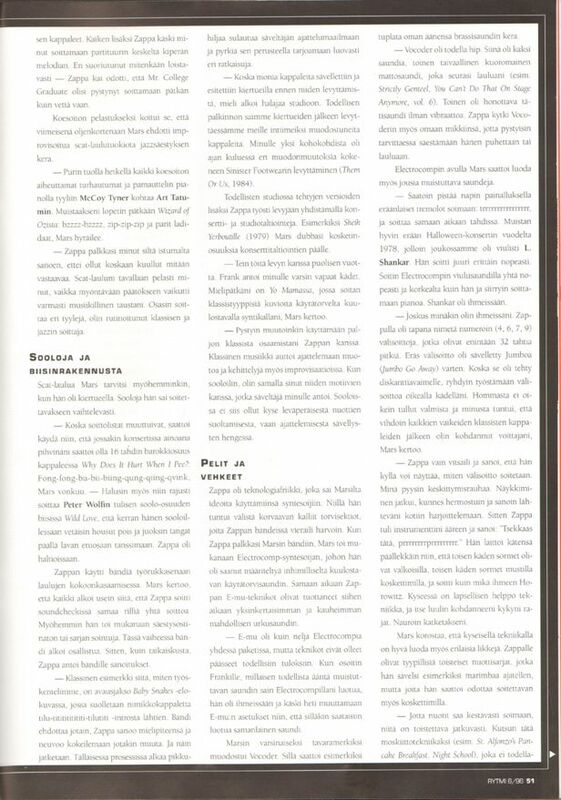 The parts 17 and 19 have never existed. 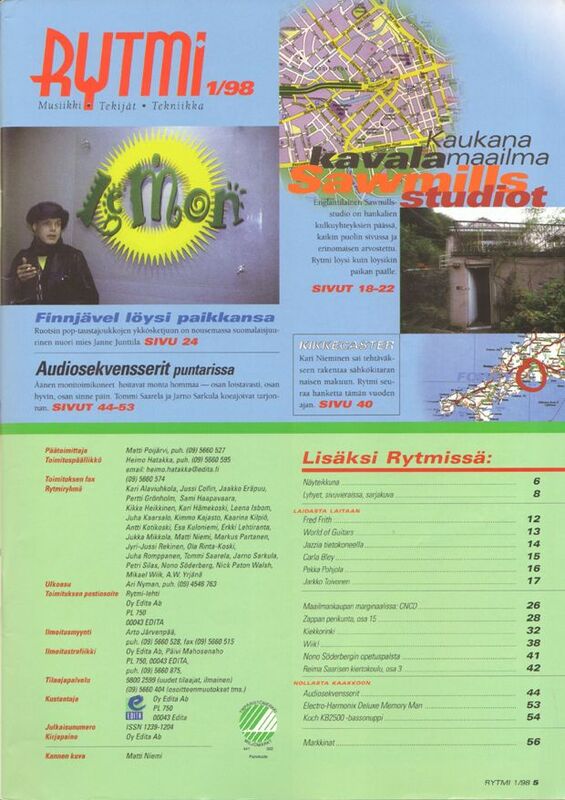 In total series consisted of 22 parts, all posted here with a help from Juha Romppanen and Heikki Poroila. Juha Romppanen lost all the original manuscripts together with computer in the beginning of 2000s and this here is the only place you can see full series Zappan perikunta. 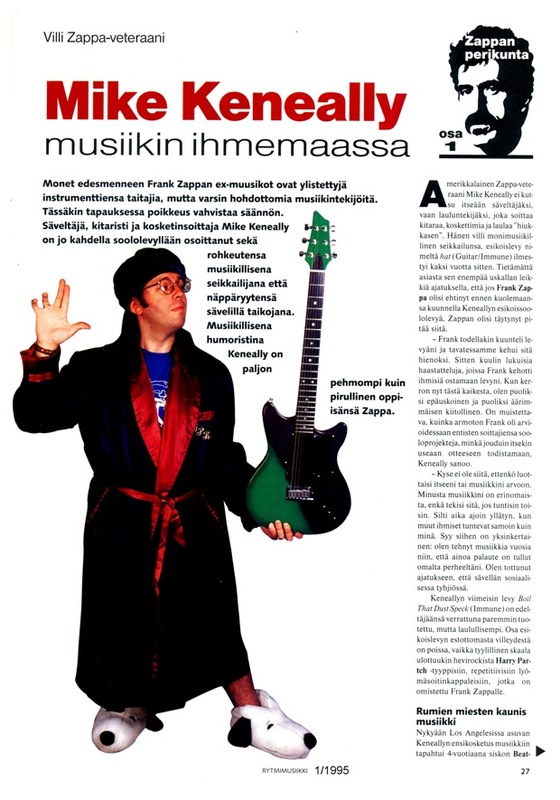 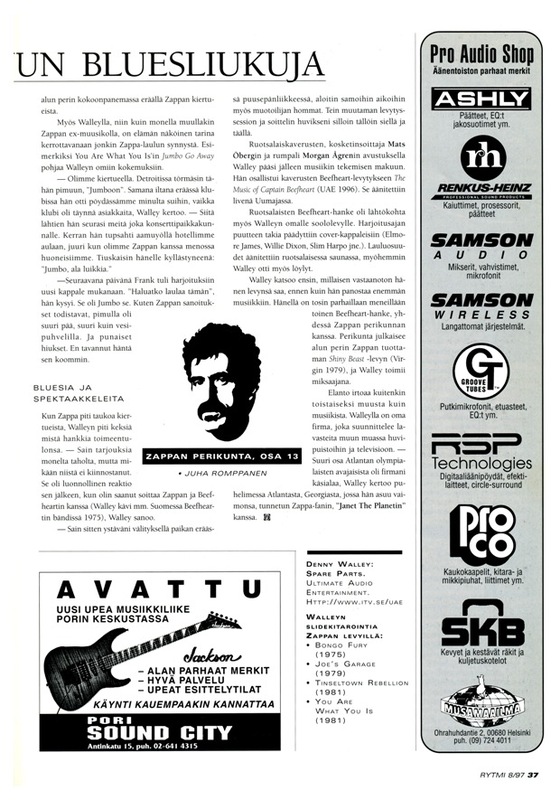 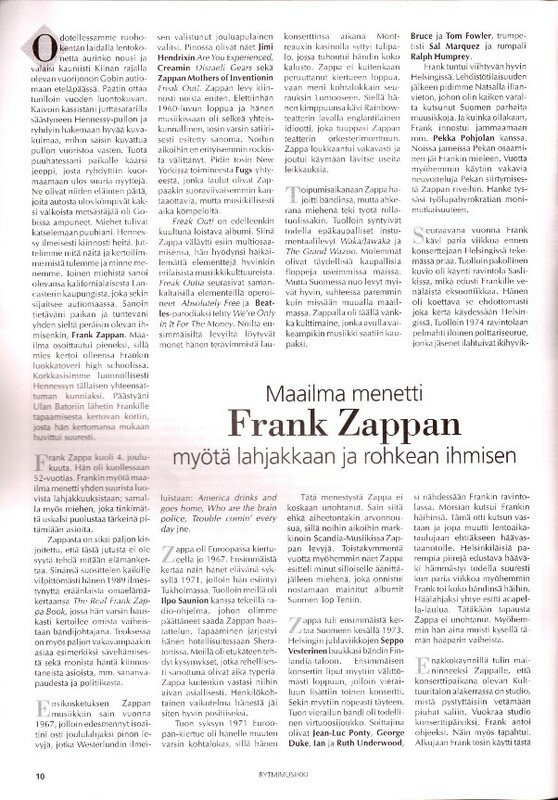 Frank Zappa oli ehkä viimeinen idolini. 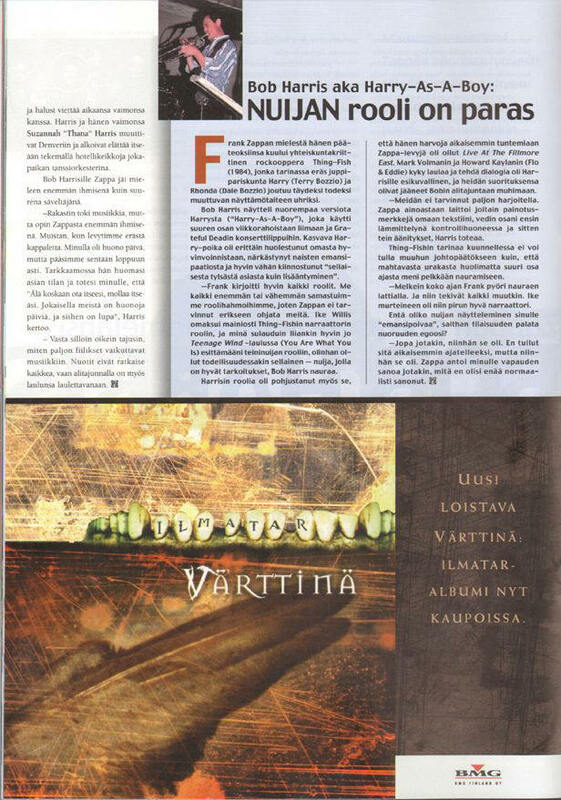 Jossain vaiheessahan idolit katoavat. 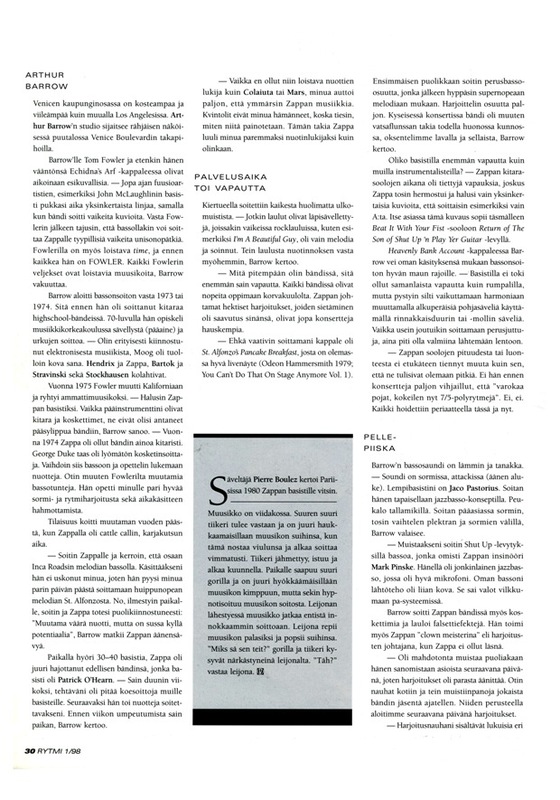 Ne muuttuvat kollegoiksi, vaikka ihailisikin niiden tekemisiä edelleen. 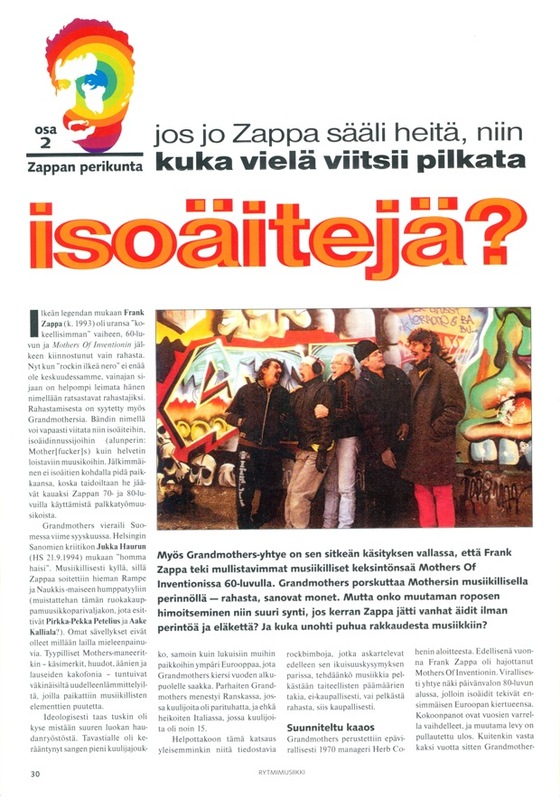 Sekosin Hot Rats-albumiin niin totaalisesti, että soitin niitä puhki peräti kaksi kappaletta! 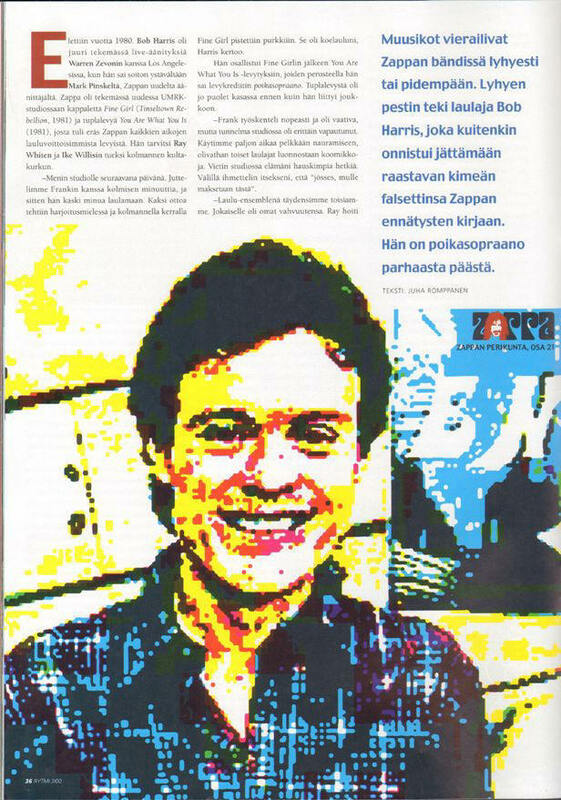 Olihan se yksi elämäni kohokohtia, kun kotiin tuli eräänä aamuna puhelu maestrolta itseltään. 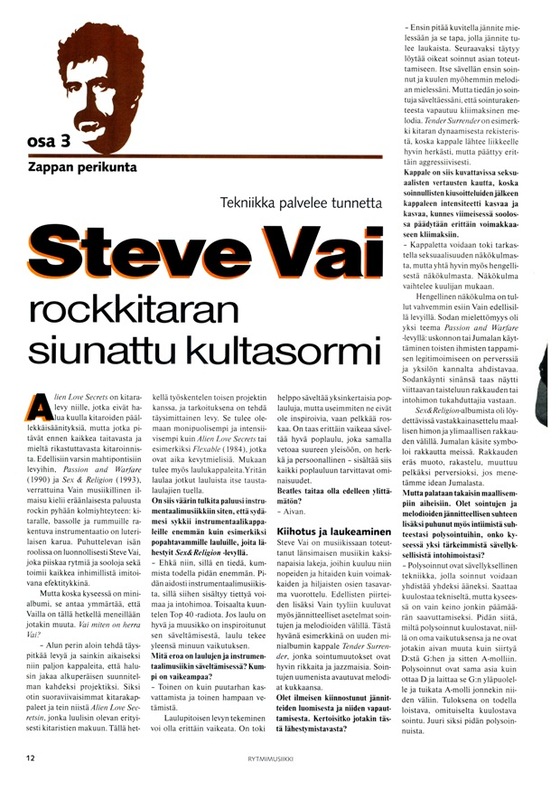 Tapasimme useampaankin ottee- seen ison sinfonia-rockhankkeen tiimoilta, joka tosin meni taloudellisista syistä puihin. 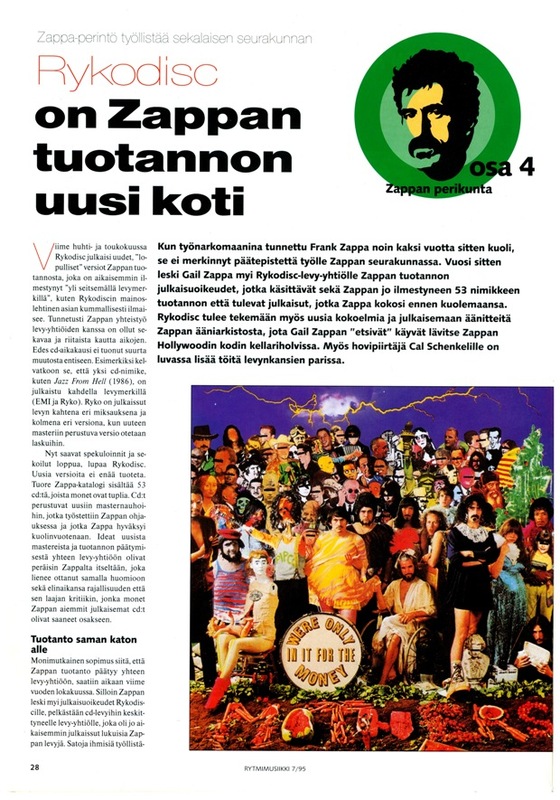 Zappa pahoitteli tapahtunutta kovasti ja lupasi että tehdään tämä myöhemmin. 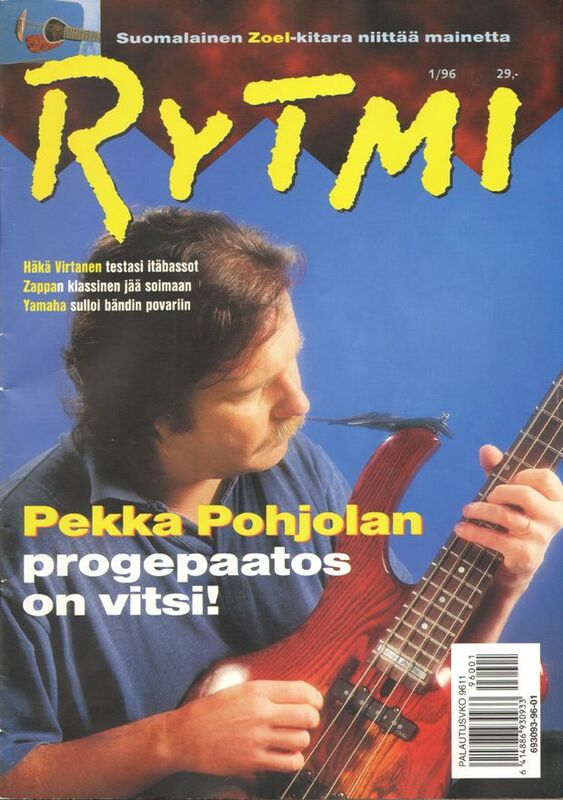 Jäi tekemättä. 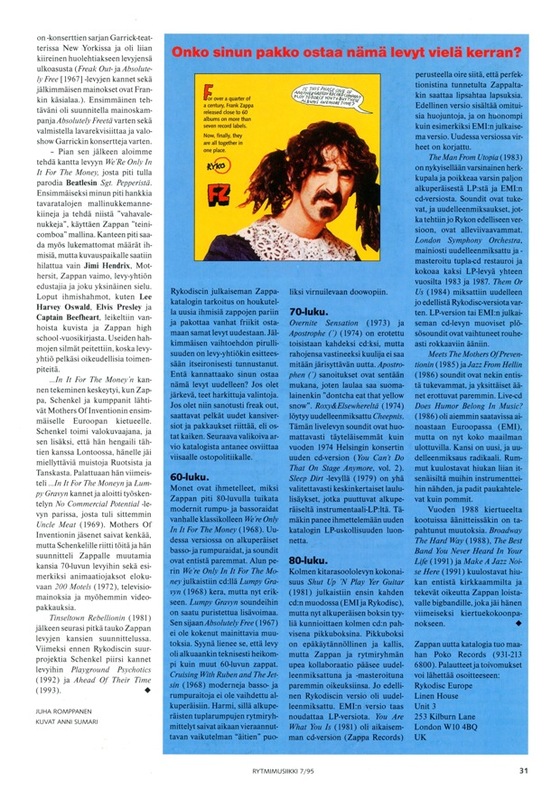 Frank Zappa was perhaps my last idol. 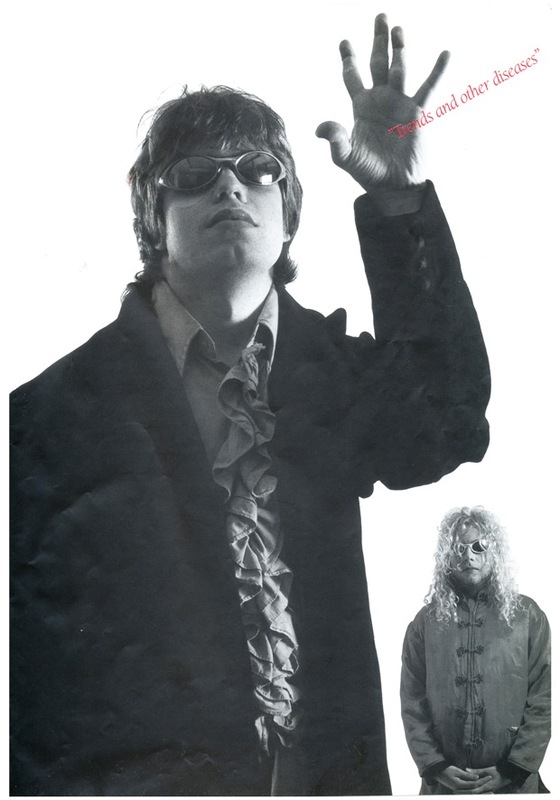 At some point, idols disappear. 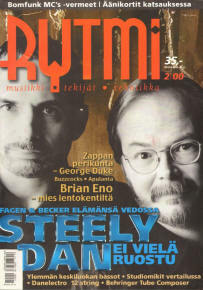 They become colleagues, but you still admire what they do. 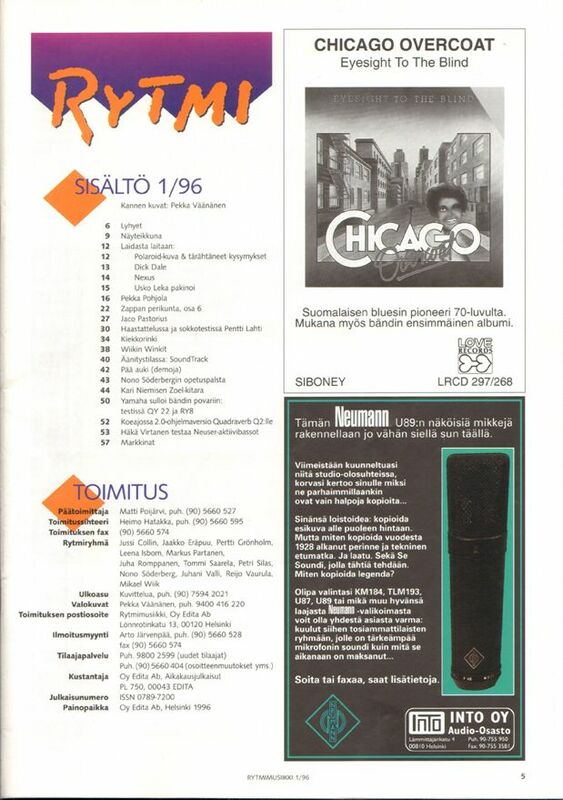 I was totally crazy for the Hot Rats album and often I played two songs from there in a row! 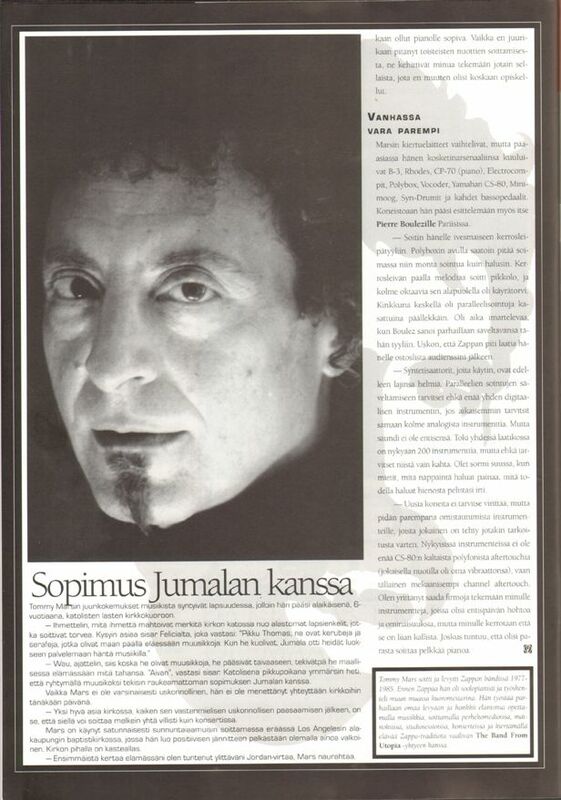 It was one of the highlights of my life when one morning at home I got a call from a the maestro himself. 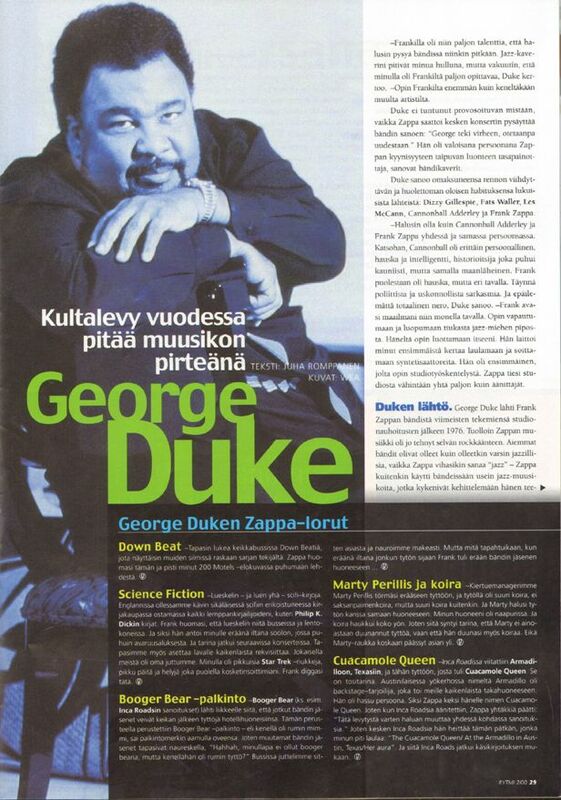 We met on several occasions about a big symphony-rock project, which, however, for economic reasons was not realized. 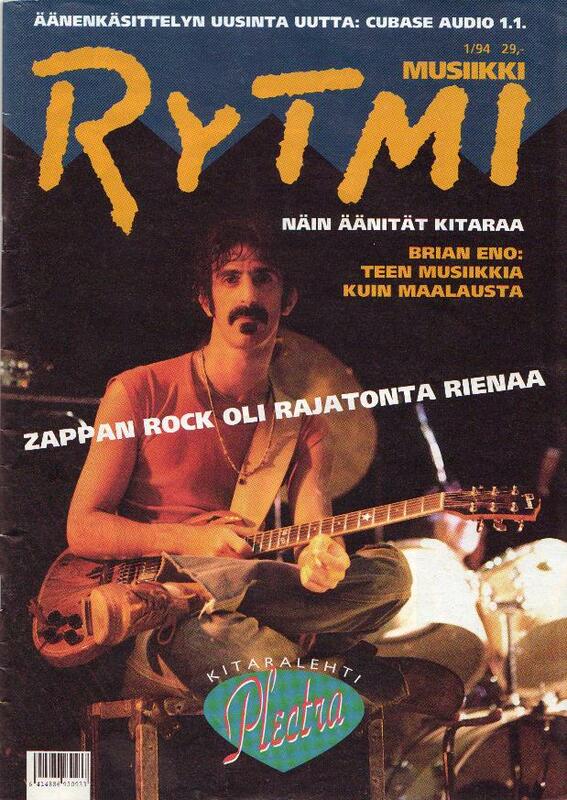 Zappa was very disappointed and promised to do this later. 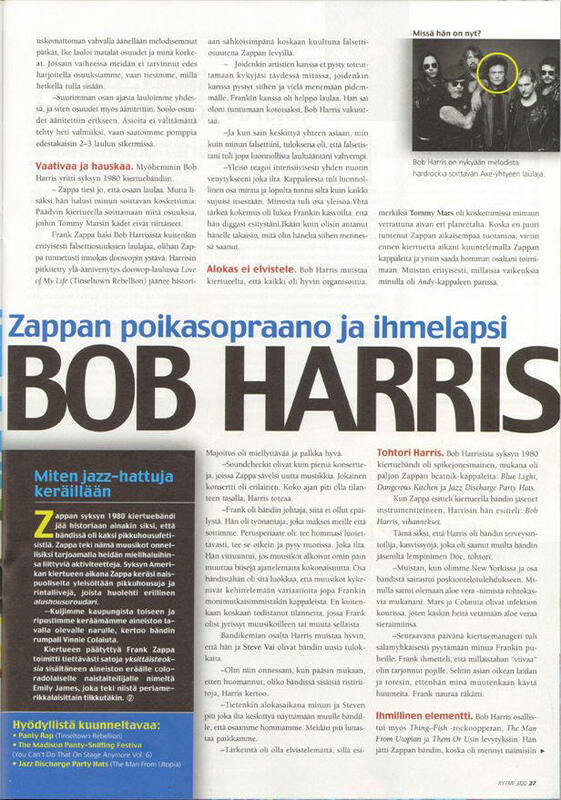 It never happened. 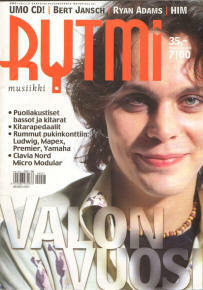 On pages 22-23 are Rytmi "Millenium" readers poll results. 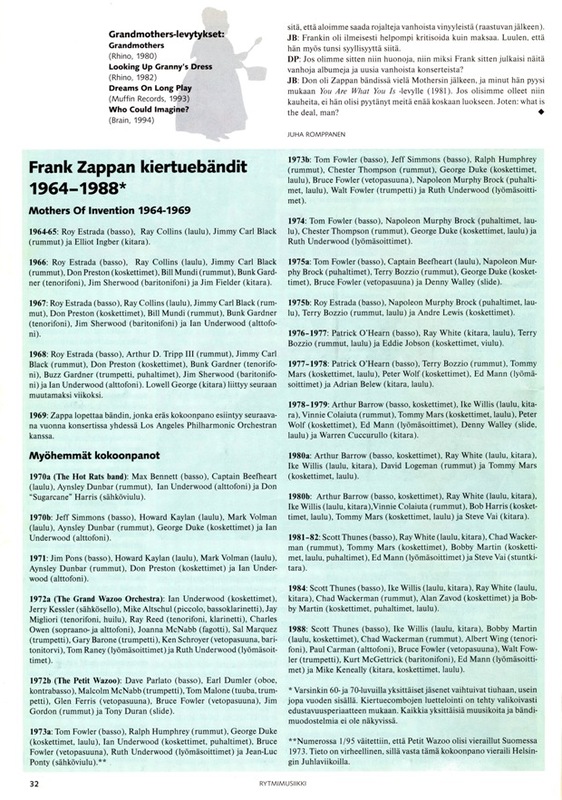 Frank Zappa is listed as #2 composer of the century and #5 musician of the century. 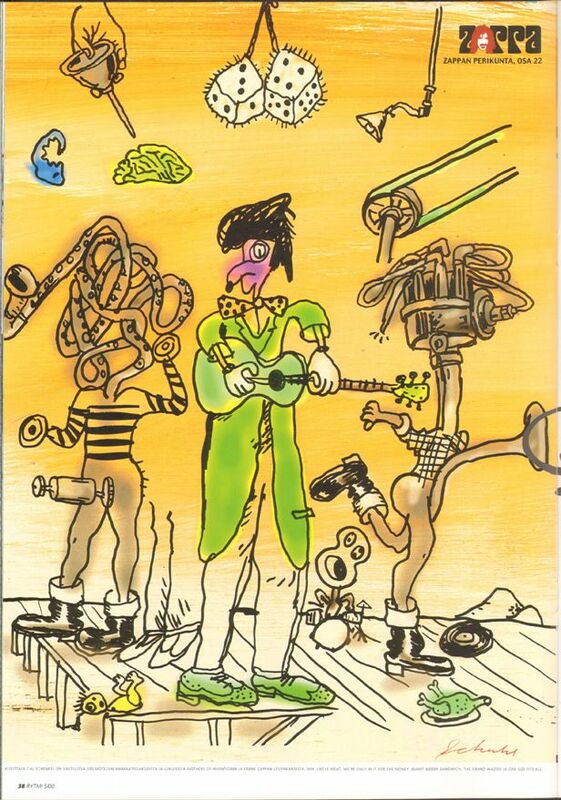 Touring can make you crazy. 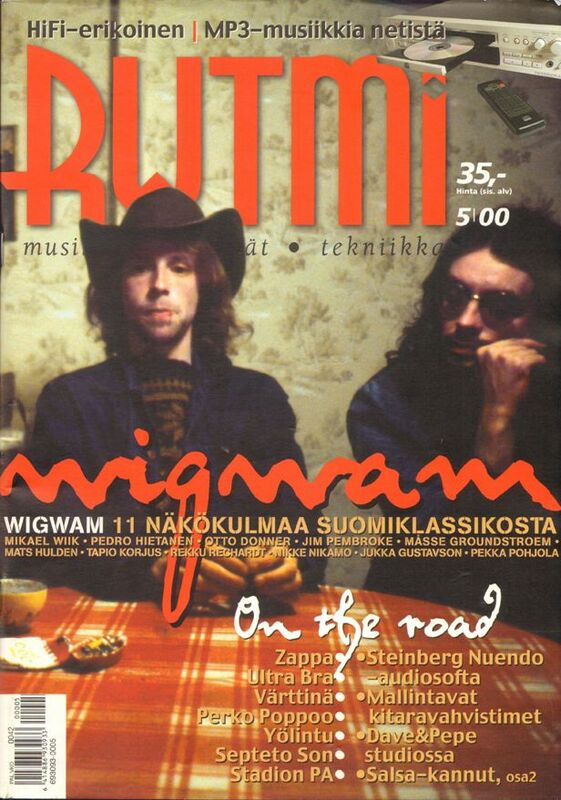 On the road. 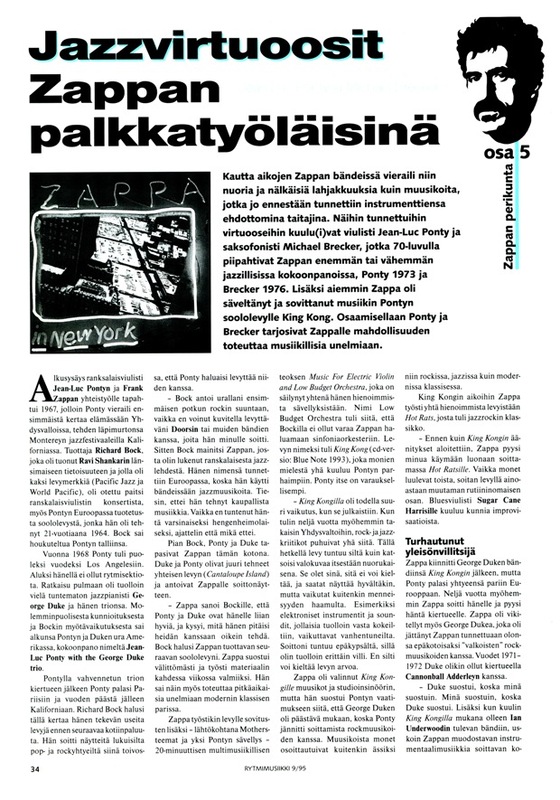 On p 3 is a comics about Zappa the coffee drinker. 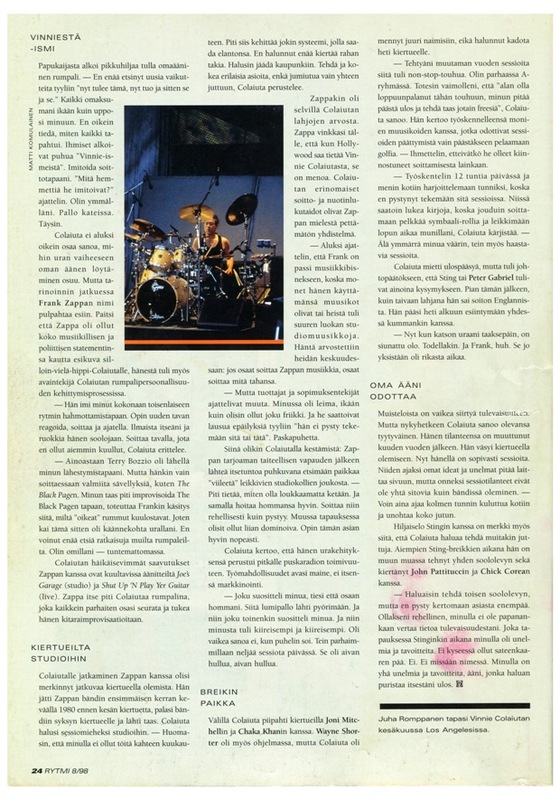 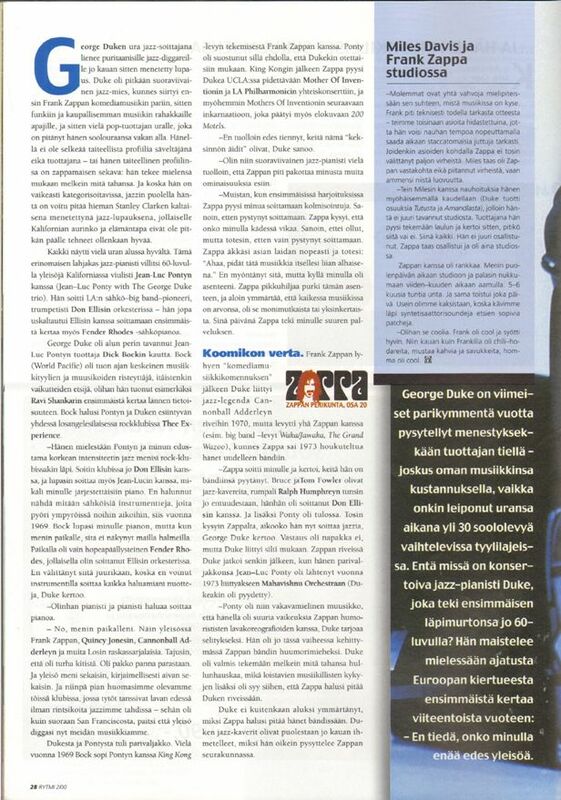 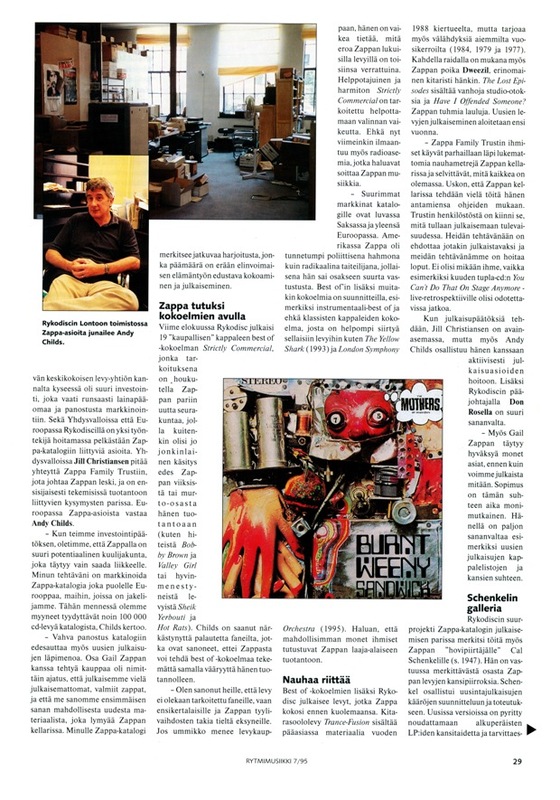 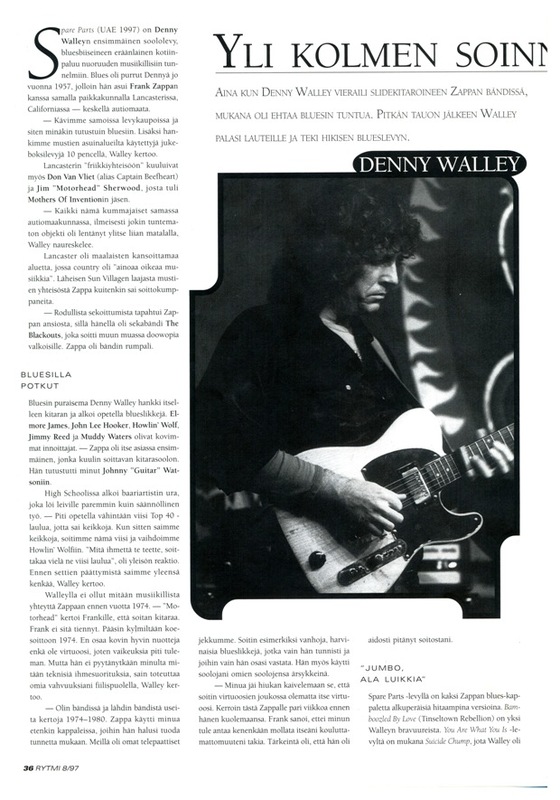 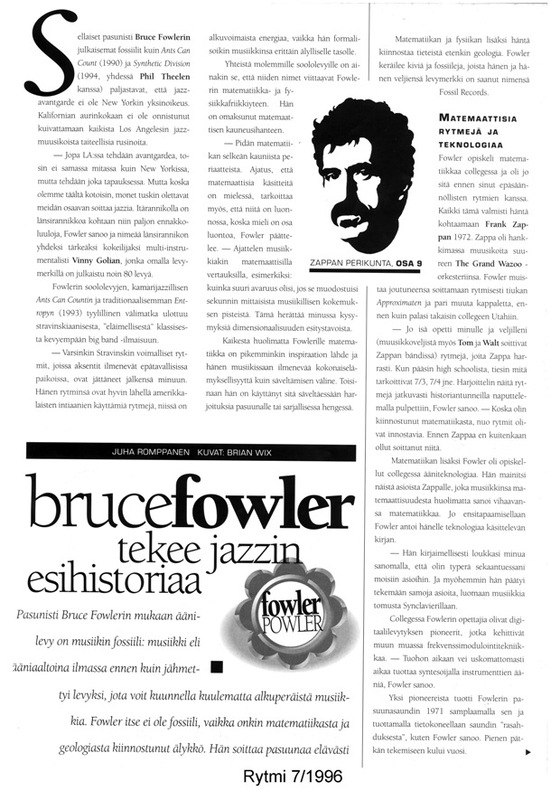 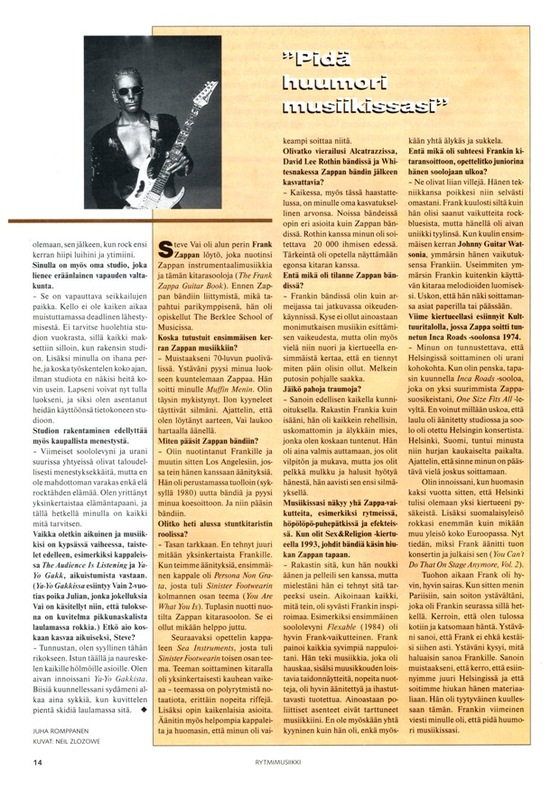 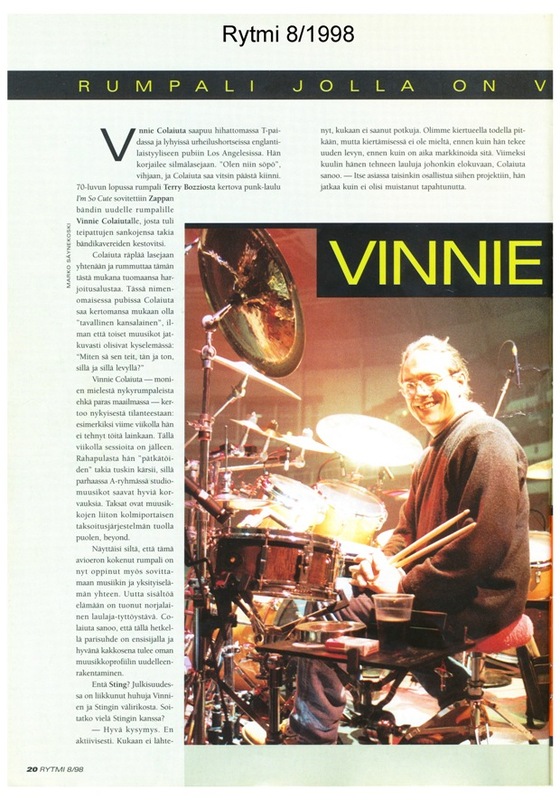 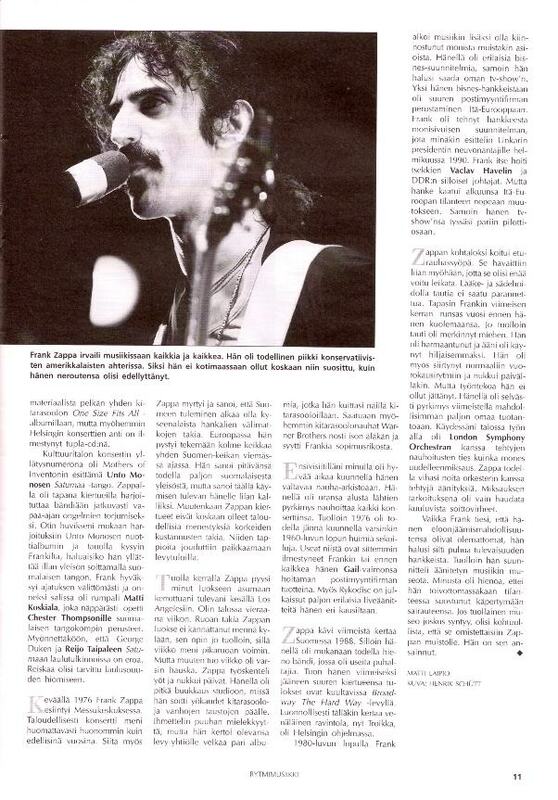 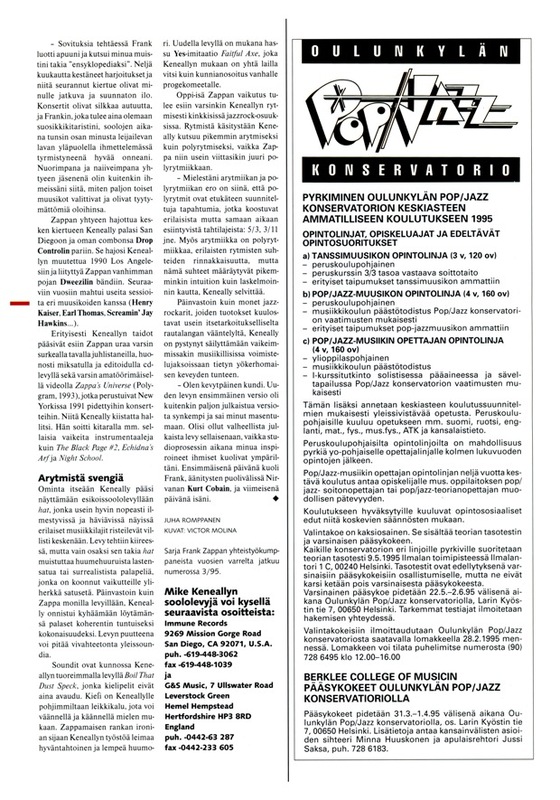 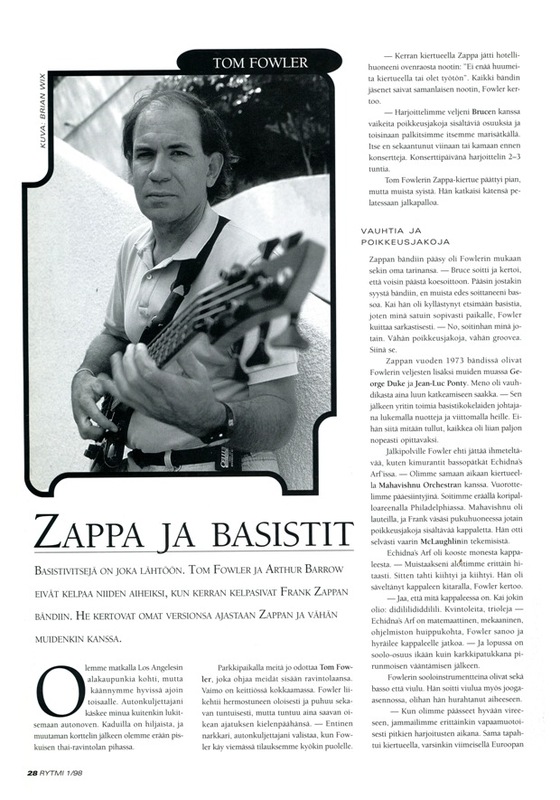 The main article is on FZ and jazz. 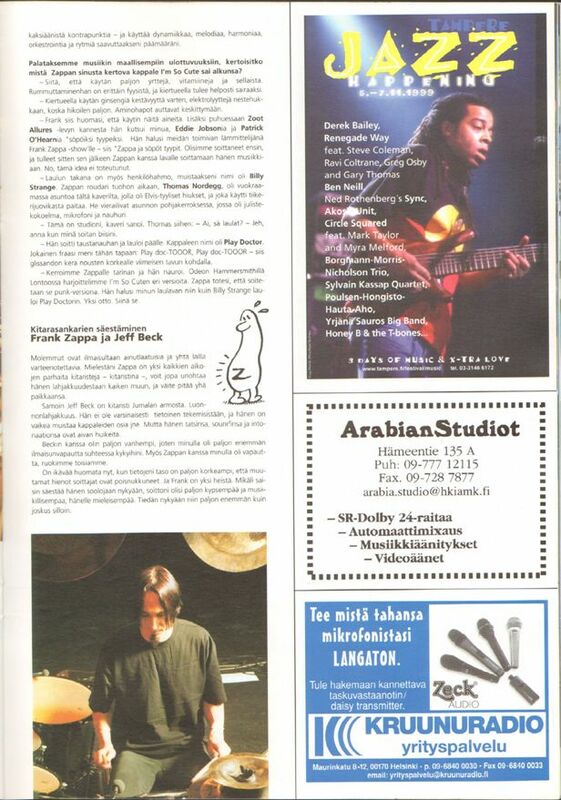 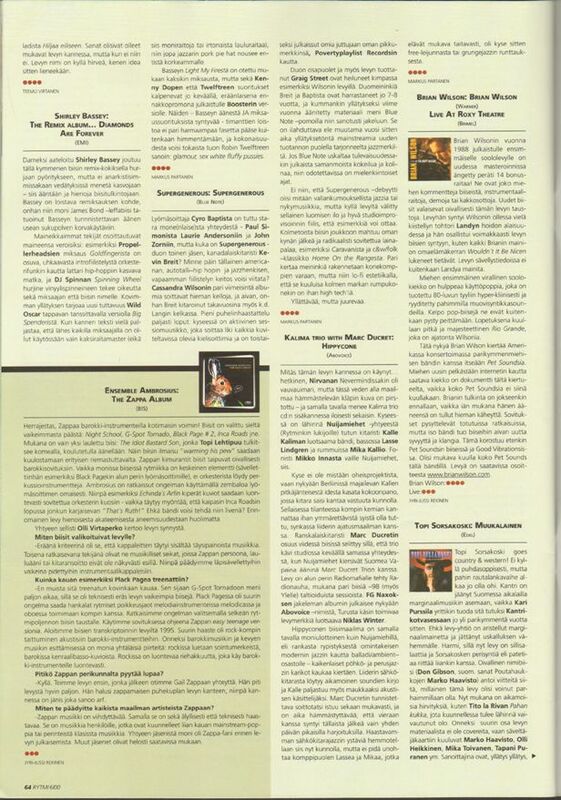 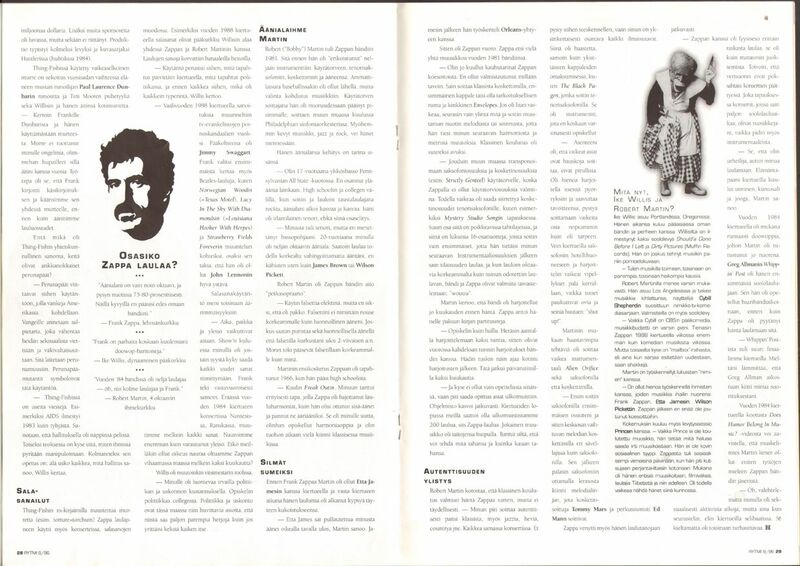 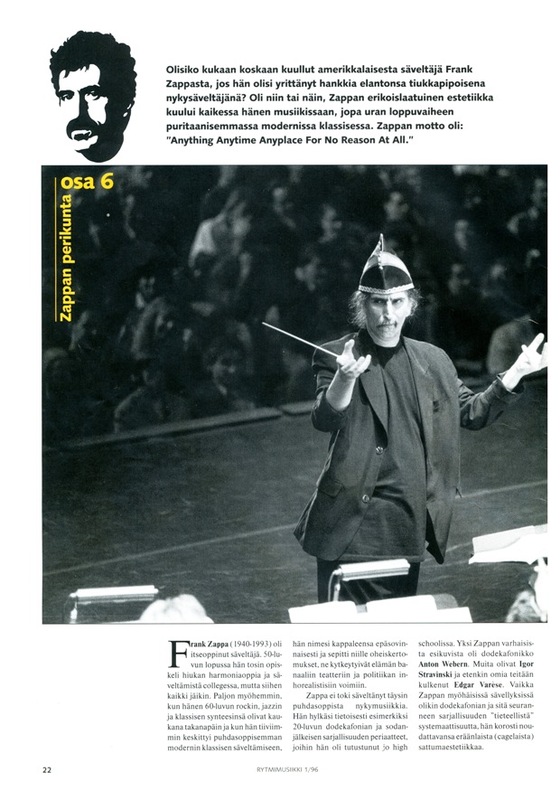 On pages 12-13 is reviewed UMO plays Frank Zappa feat. 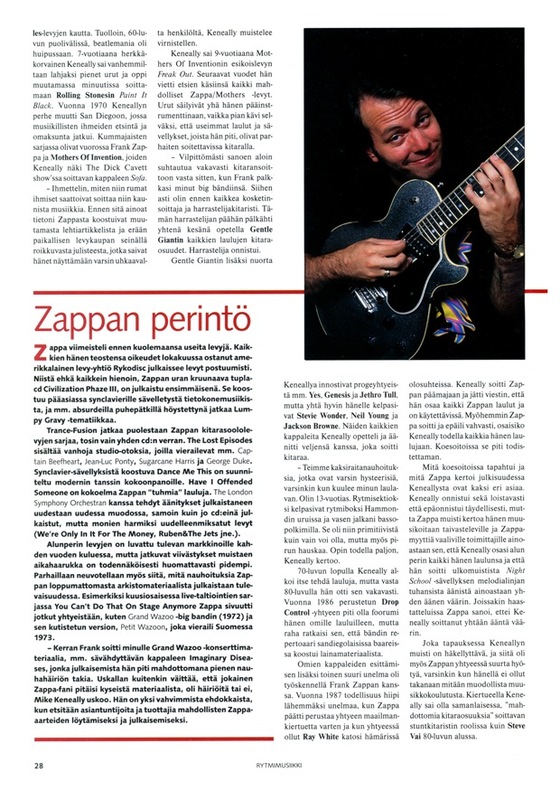 Marzi Nyman.